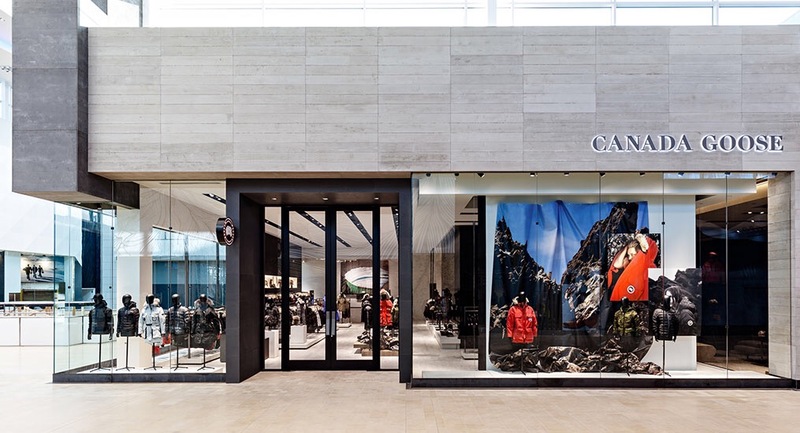 Continuing its global expansion, Canadian winter clothing specialist Canada Goose Holdings has announced it will open two flagship stores this autumn, in London and Chicago. 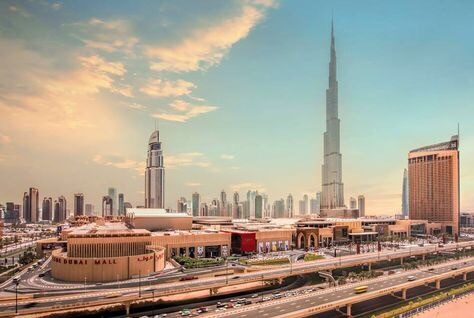 The company has also announced the expansion of its e-commerce channel to seven new markets including Germany, Sweden, Netherlands, Ireland, Belgium, Luxembourg and Austria. 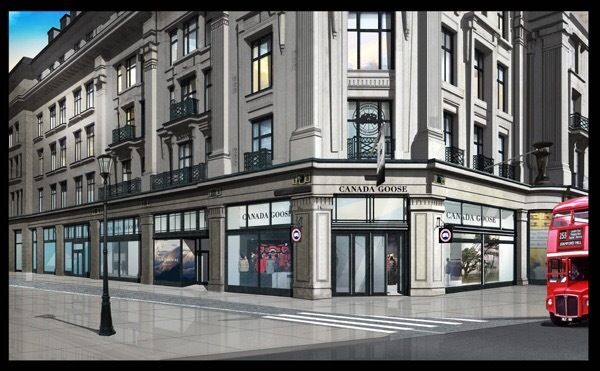 Marking the company’s first location in Europe, the Canada Goose London flagship store, the brand’s largest retail space to date, will be located on Regent Street. 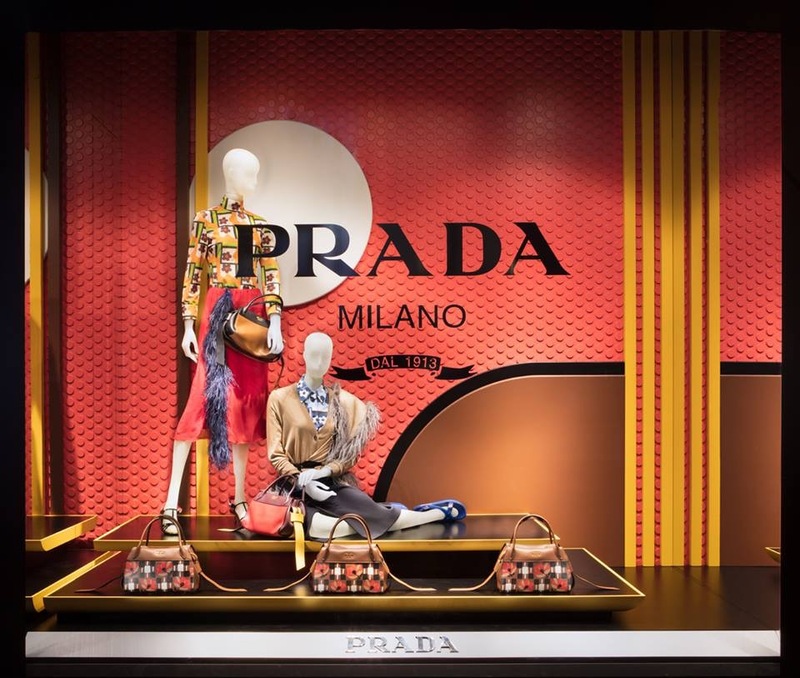 In Chicago, the brand will open its doors on Magnificent Mile on Michigan Avenue. 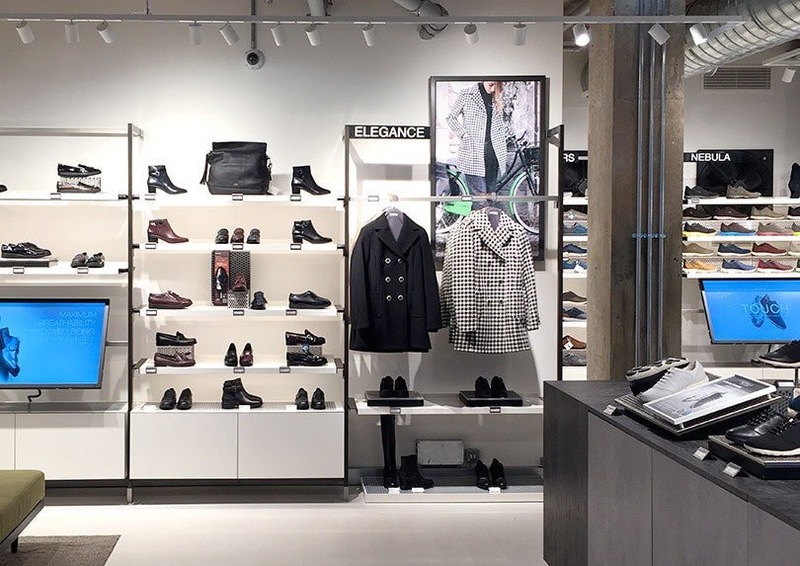 Both stores will feature inspired Canadian design elements, including marble quarried in British Columbia, as well as the broadest assortment of seasonal collections and exclusive collaborations, and will provide an opportunity for consumers to engage and learn more about the company’s 60-year history. ‘Opening our first European store is not only a milestone for Canada Goose, but it’s turning a dream into reality. London and Chicago are world-renowned shopping destinations and I’m proud to bring our Canadian heritage, experience and unparalleled product to their historic streets,’ says Dani Reiss, president & CEO of Canada Goose. In 2016, Canada Goose opened its first two flagship stores in Toronto and New York, showcasing the spirit of Canada Goose. The stores weave together the brand’s authentic heritage and commitment to craftsmanship with modern design in an Arctic-inspired environment. 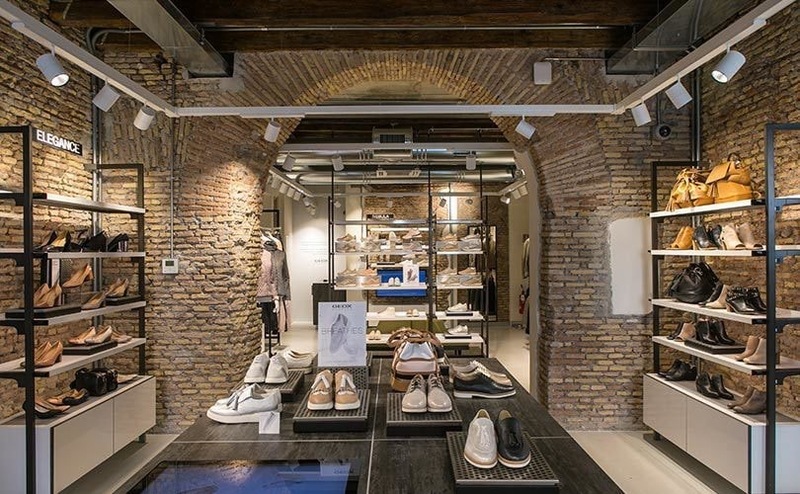 Footwear and apparel retailer Geox has unveiled its newest store concept in Milan, Italy which aims to bring together technology, design, sustainability, and well-being. 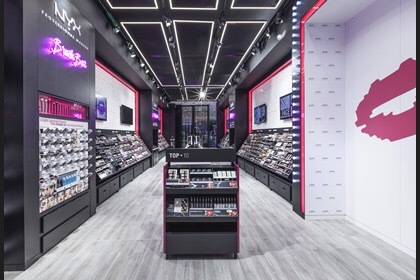 Known as the ‘X Store’ concept, the new design preserves and enhances existing architectural features in the building, such as glass windows, columns, ceilings and exposed brickwork and works them seamlessly into the new concept. 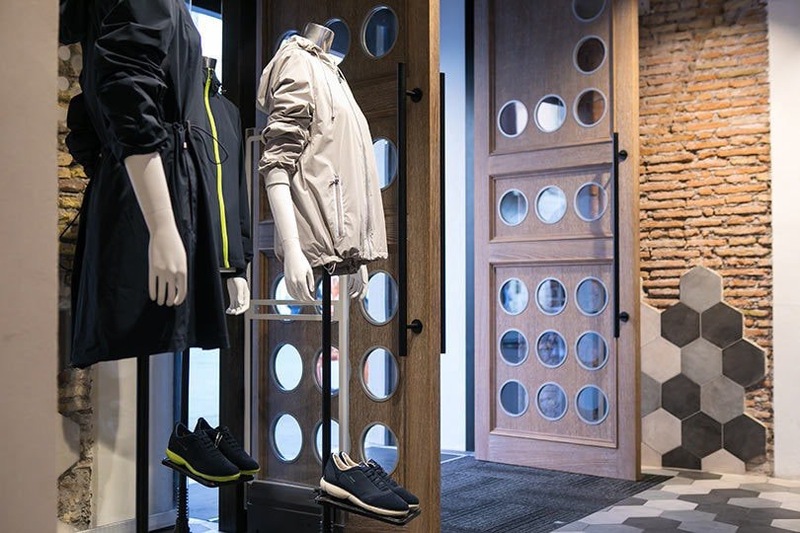 In line with Geox focus on sustainability the new store concept, which has been unveiled in Geox flagship stores in Rome, London, Toronto Kuala Lumpur, uses only green materials. 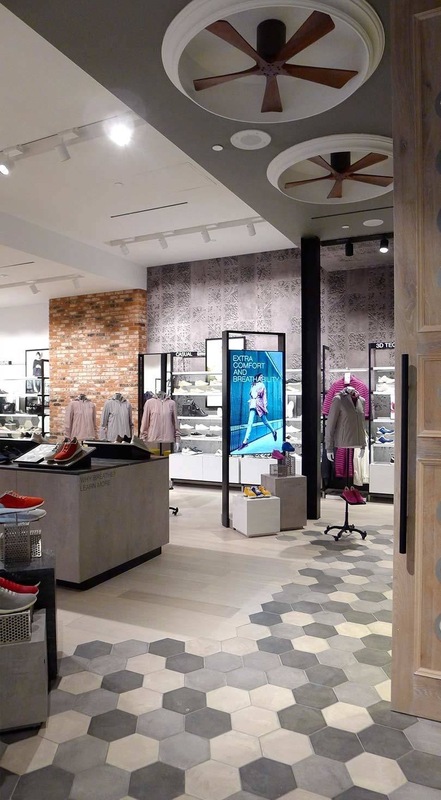 In fact, all materials used in Geox X Store concept, ranging from the terracotta tiles to the natural wood, are compliant with Leed Certification, in line with the company’s commitment to the environment. 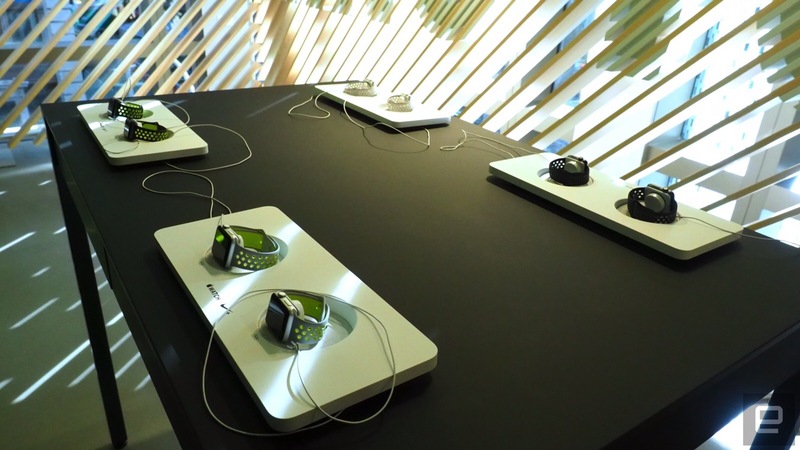 The new concept also features a range of digital touchpoints to offer consumers a multi-sensorial shopping experience. 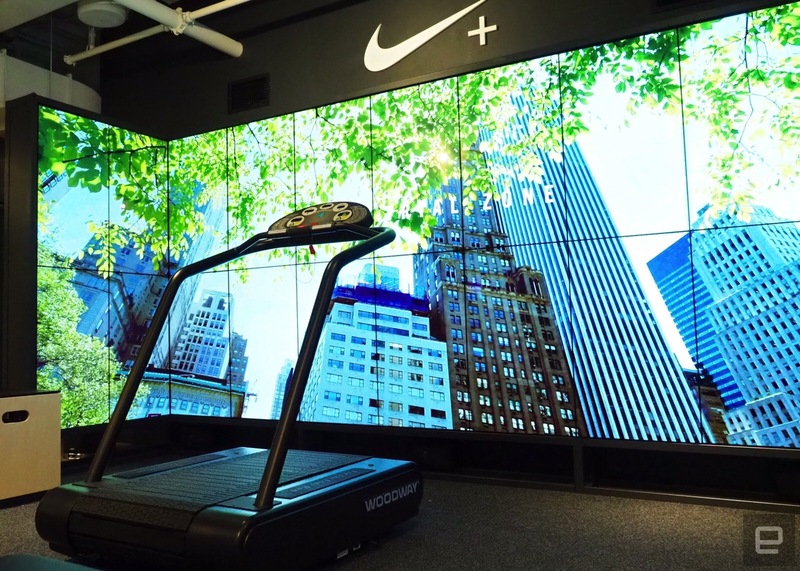 These range from integrated digital screens and interactive displays where customers can learn more about an item, to charging stations in the fitting rooms. 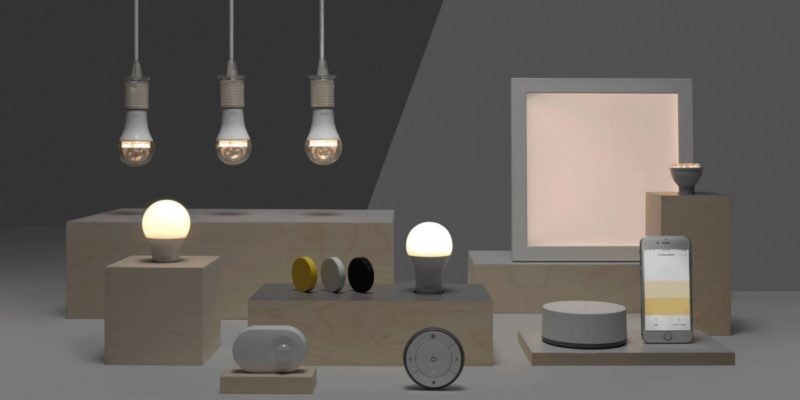 X Store is said to offer further proof of how important technology is to the Veneto-based company. 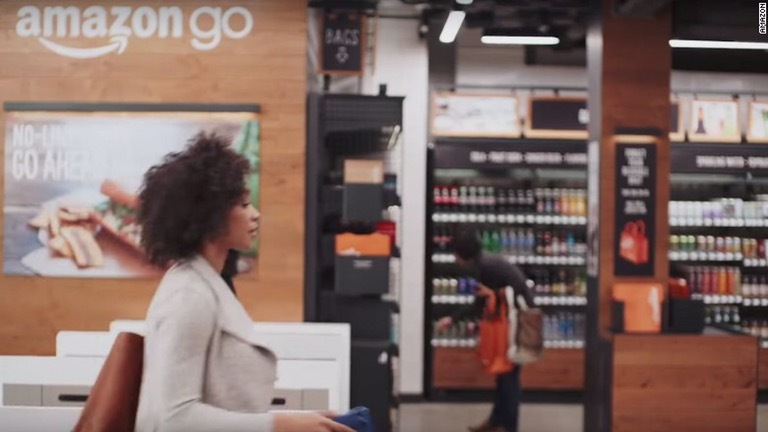 “This is a brand-new approach to retail. 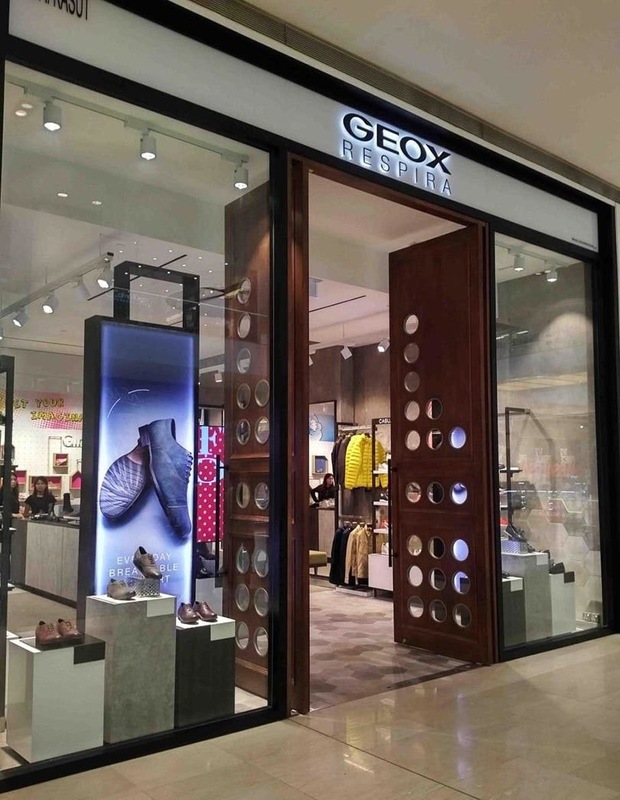 As soon as customers cross the threshold of a Geox store, they breathe, see and absorb the values which inspire our corporate design philosophy and mission day by day, gaining insight into our immense motivation to constantly improve quality and performance,” said the company in a statement. 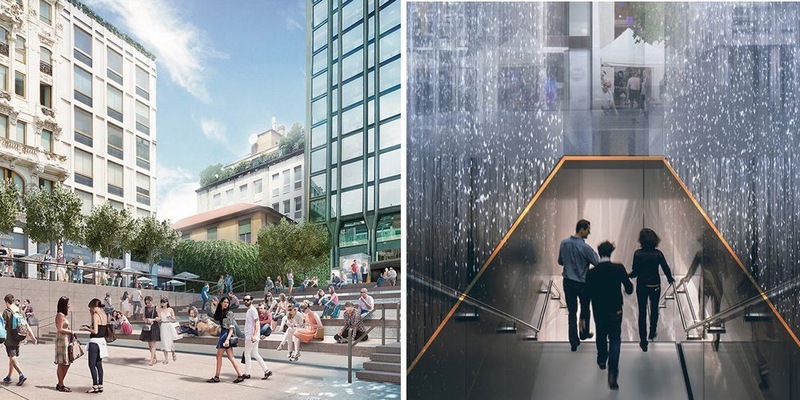 It was back in January that we first heard that Apple was planning a new flagship retail store in Milan, Italy, with an outdoor amphitheater – and the company has now confirmed those plans. The store will be named Apple Piazza Liberty and will be located at Piazza del Liberty, 1–20121 Milano. Apple is reportedly paying the city around €768k ($843k) to cover the cost of reconstructing the square after the store is completed, as well as an annual rent of €127k ($140k) for the use of the square. The opening date has not yet been announced. This is the first store I’ve seen that really makes sense of the idea of Apple Store becoming a new place to meet friends. 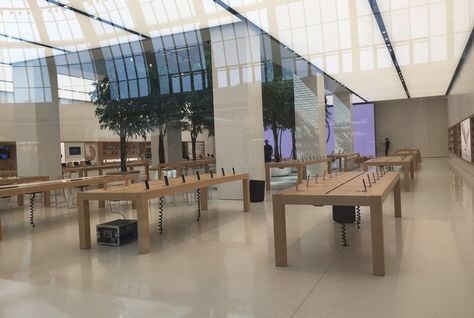 With usually crowded interiors and no tea or coffee, that aspect of the Today at Apple initiative seemed a bit of a stretch, but where the roof of your store is a piazza, the idea clearly works. Apple is also expanding both the scope and the profile of its workshop program. Apple has been rather active on the retail store front of late, removing the iconic glass cube at NYC’s 5th Avenue store as part of a major development, preparing to open its first store in Singapore, revealing plans for a Carnegie Library store in DC and ensuring that older stores unsuitable for a complete makeover don’t get completely left out. Check out a couple more photos below. Coach is being seen as the most likely buyer to win up-for-sale British luxury footwear brand Jimmy Choo as the American giant forges ahead with its plan to become a multibrand luxury player. 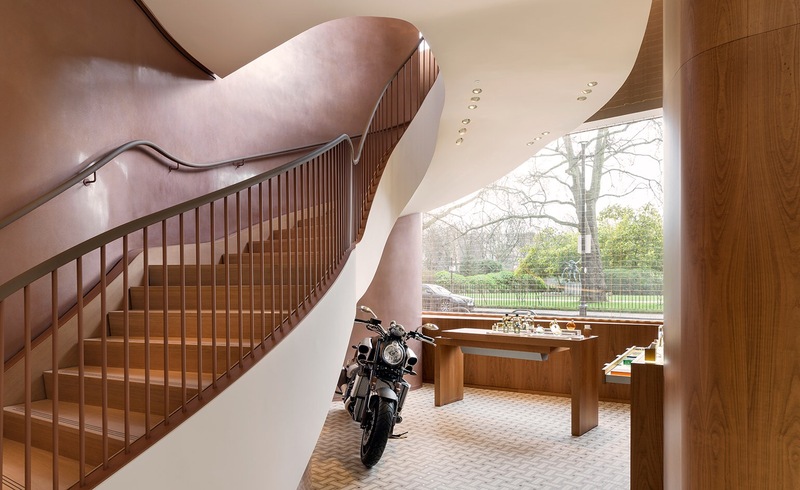 Jimmy Choo was put on the block last month after its majority own JAB Holdings decided to focus on its coffee shop and café interests leafing to its other British brand Belstaff and its Swiss luxury label Bally also being up for sale. It is thought less likely that one of the big European luxury houses would target a Jimmy Choo buy with Coach’s rivals more likely to be wealthy private equity investors from Asia or the Middle East. Buying Jimmy Choo would instantly strengthen Coach’s presence in the growing footwear sector and take it even into more upmarket territory than its existing premium-to-luxury Stuart Weitzman label. Industry sources told the Sunday Telegraph they see $11bn market-cap Coach as having the resources to beat off competition for Coach, as well as the investment cash to expand it fast. 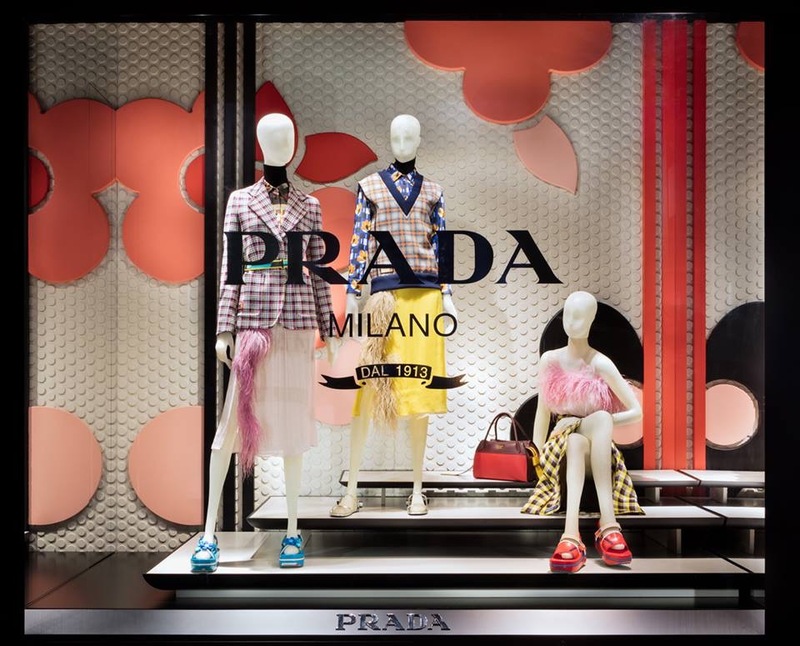 The company also benefits from the Coach brand’s new president and CEO, Joshua Schulman, having been CEO of Jimmy Choo until 2012. After buying Stuart Weitzman for almost $600m in early 2015, Coach continued its won turnaround and drove Weitzman’s sales upwards. 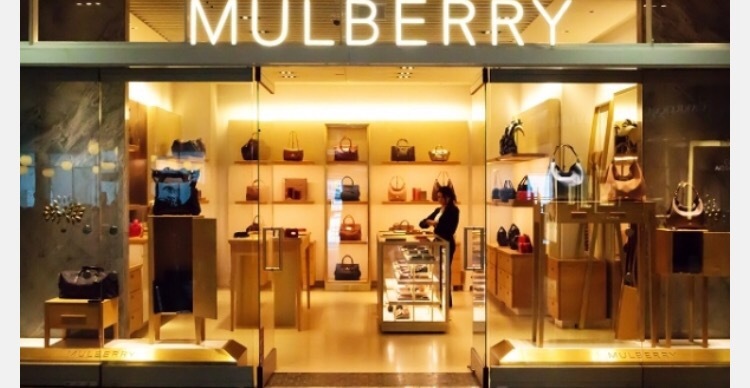 It now seems determined to convert itself into a much bigger multibrand player and in recent months an audacious approach to buy Burberry was turned down by the UK firm. Coach is still among the big names linked to a potential Kate Spade buy, however. Whether it eventually wins Spade, Kors or any other giant brand, with Jimmy Choo potentially having a £700m-plus prince tag, buying it would be an affordable way to give Coach a label with massive growth potential and an as-yet-under-exploited presence in the key Chinese market. It’s also a brand that’s growing fast in the men’s sector and has a thriving perfumes portfolio, two crucial growth areas. 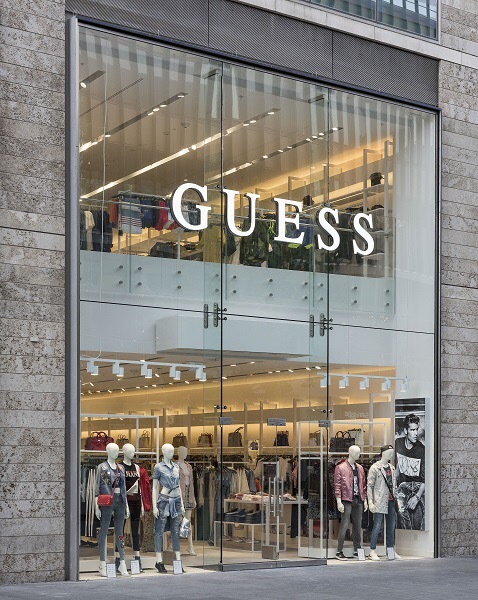 Fashion brand Guess has opened its largest UK store outside London, with a 465 sq m (5,000 sq ft) store in the Liverpool ONE development. The store, designed in-house, is arranged over two floors. 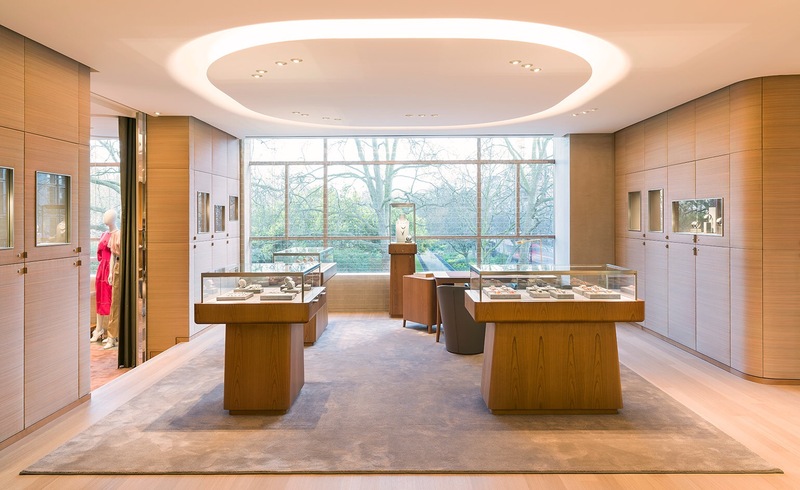 It features a clean, white interior, high-tech lighting and contrasting materials, in line with the chain’s recently updated branding and layout plans. Merchandise is presented to offer ‘total looks,’ with accessories displayed in the centre of the store to maximise visibility. “We are delighted to have opened this store and started trading during the busy Bank Holiday weekend. 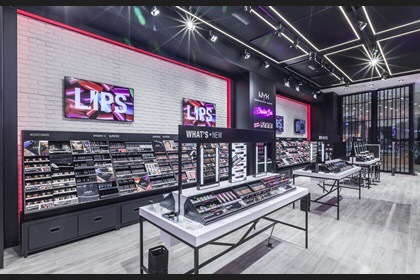 It has been a great opportunity for us to introduce the new store concept and branding to Liverpool ONE’s stylish shoppers and we have received very positive feedback in addition to strong sales already,” says Guess CEO Victor Herrero. 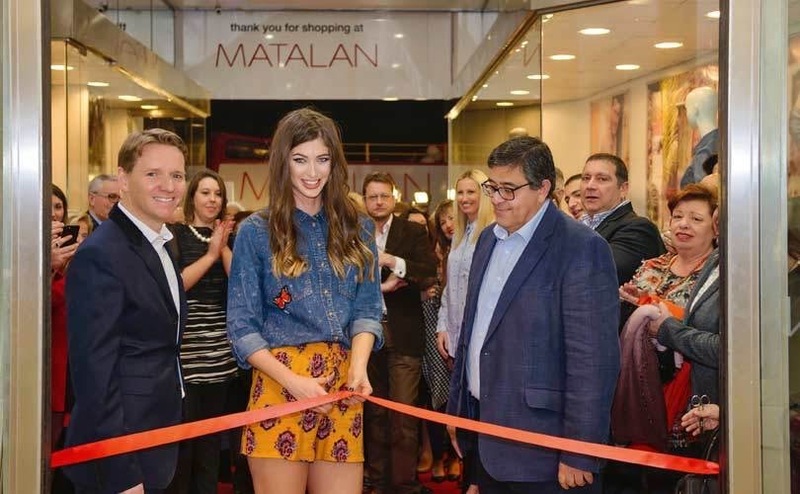 “The brand has created a great store, bringing the best of London to Liverpool,” says Miles Dunnett of property group Grosvenor Europe. London – Although Juicy Couture has seen somewhat of a revival recently, it seems as if parent company’s Authentic Brands Group best efforts were not enough to keep the brand afloat in the UK. The fashion brand, best known for its bling velour tracksuits favoured by the likes of Paris Hilton over a decade ago, is set to pull out of the UK market. 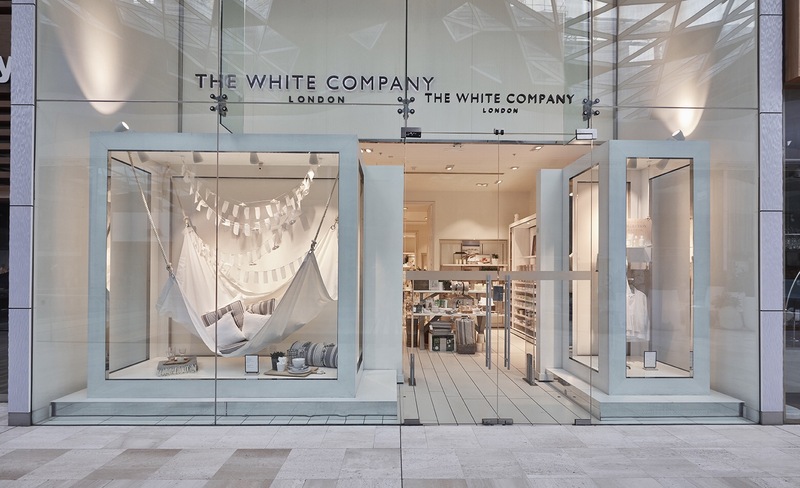 At the moment the label currently counts two stores in the London – one on Regent Street and another in Westfield White City, in addition to an outlet in Bicester and a store in Bluewater. But a report from the Telegraph states Juicy Couture is set to close its UK stores and will only retain an online presence in the UK. Juicy Couture also counts a number of concessions in Harrods, Selfridges and Topshop in the UK, but it remains unclear what Authentic Brands Group aims to do with its concessions. 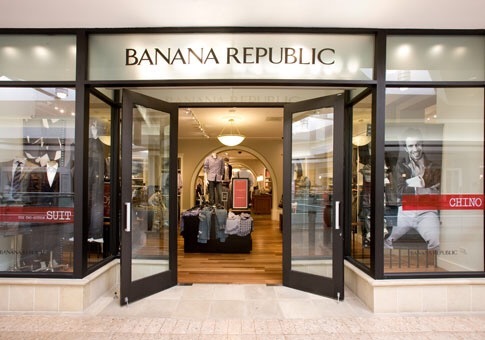 The move follows on from fellow US brand Banana Republic’s withdrawal from the UK amid increasing difficult trading conditions. ABG acquired Juicy Couture four years ago for 195 million dollars. The licensing company is best known for its celebrity brands, such as Elvis Presley and Marilyn Monroe. FashionUnited has contacted Authentic Brands Group for additional commentary. 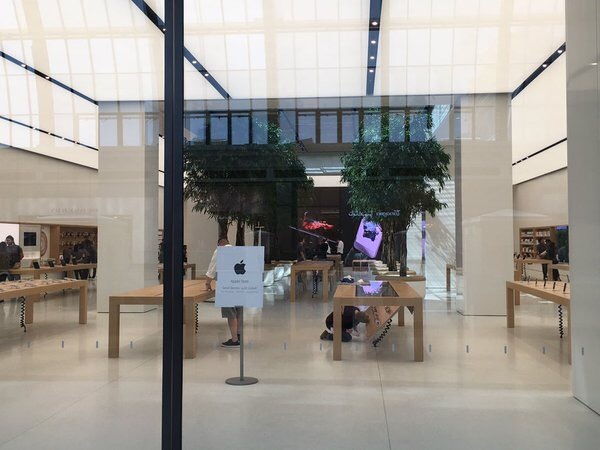 The new details come via a report from AppleInsider, which cites a “person familiar with the matter.” Apple is said to be taking over large retail space in Antara Fashion Hall, which was most recently occupied by Crate & Barrel. The location is twice the size of Apple’s current Mexico City store in Centro Santa Fe mall’s high-end Via Santa Fe wing. 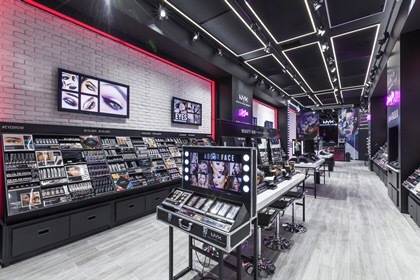 The design of the new Ciudad de Mexico store is said to be similar to that of the new World Trade Center store in New York City, which just opened last August. 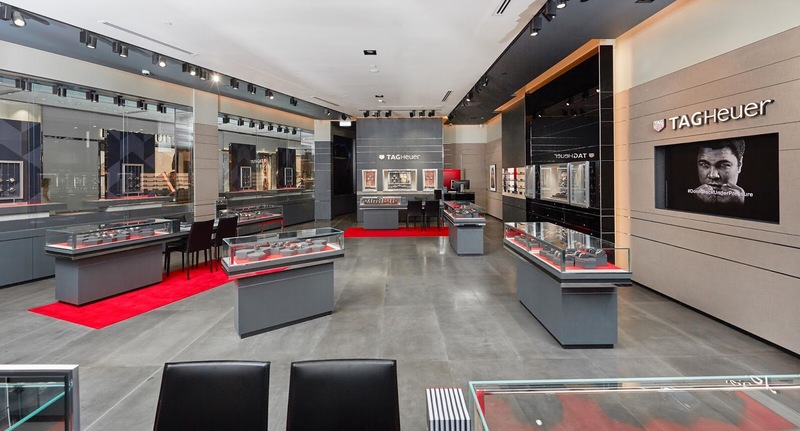 The store features high-end design traits such as a high ceilings, a 37-foot custom-built TV screen, and much more. 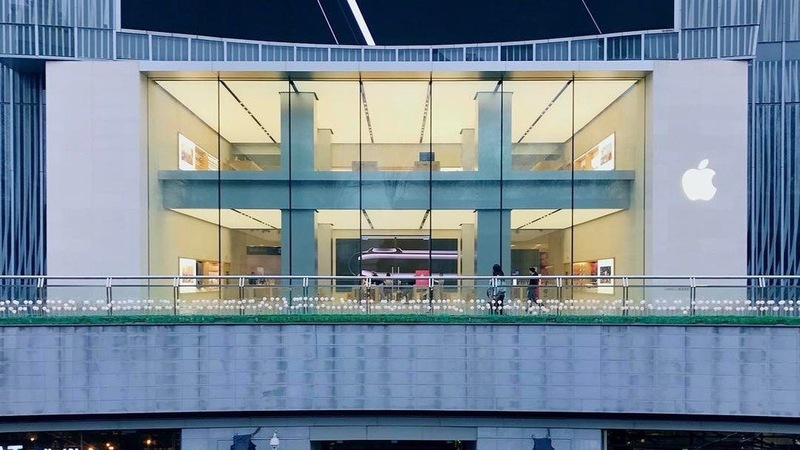 Apple’s new Ciudad de Mexico store is also expected to be multi-level, meaning the Genius Bar and retail space might be split from one another, similar to other multi-level Apple Stores around the world. 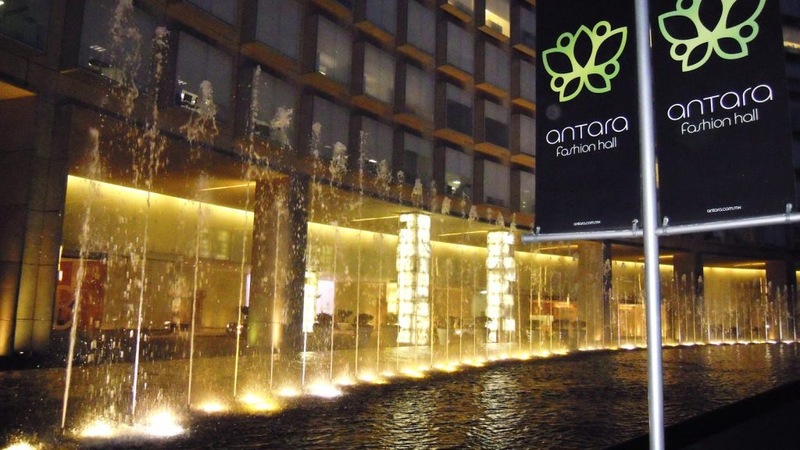 The Antara Fashion Hall first opened its doors in 2006 and comes in at over half a million square feet. It features 3 floors of retail space, restaurants, and a movie theater. It’s located three blocks north of Avenida Presidente Masaryk, which is known for its high-end, luxury shopping amenities. 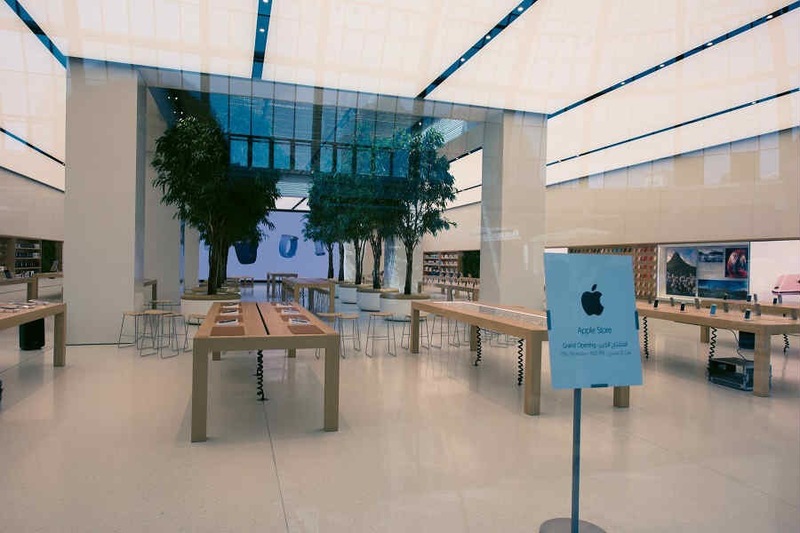 Specific details about when Apple plans to open its new flagship retail location remain unclear, but it’s likely a long way away at this point. The news of Apple’s newest Mexico City location comes as its first retail space in the city, opened last September, is experiencing unusually high sales and struggling to keep up with demand. Today’s report also adds details such that Apple is mulling an expansion in Brazil. 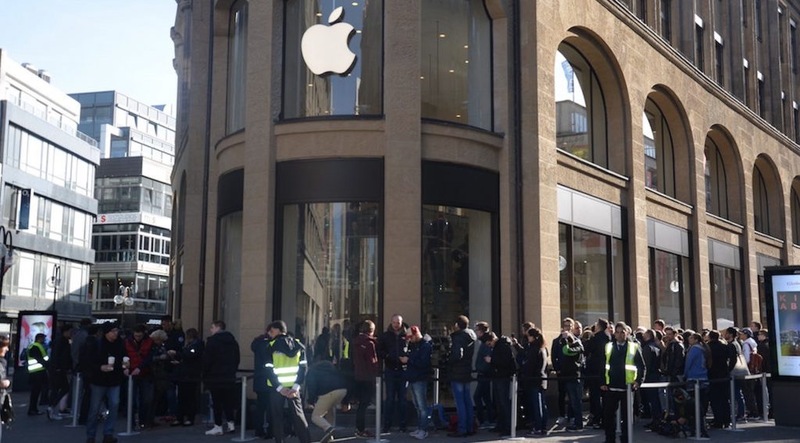 Company officials are reportedly in the process of determining whether or not Apple will open two additional stores in the country, including one new flagship location in Sao Paulo. As of now, Apple operates two retail locations in Brazil. H&M is opening a new Westfield Stratford store on 21 April. 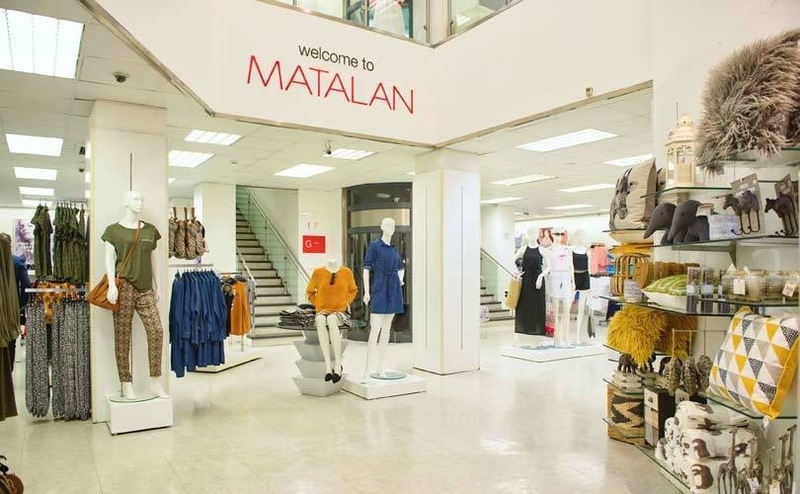 The retailer is relocating from its current location and expanding its offering to become the largest store in the UK and IE portfolio and one of the largest H&Ms in the world. Situated over three floors and covering 5,074 sq m of sales space, Westfield Stratford City will offer fashion-forward collections across ladieswear, menswear, Divided and kidswear. 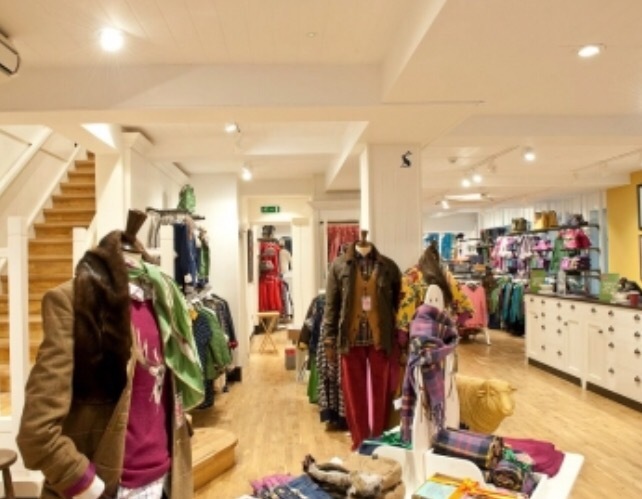 The store will also stock the brand’s homeware and beauty ranges. ‘H&M is delighted to be expanding in Westfield Stratford. The new store will become our largest in the UK and IE, as well as a global flagship store. 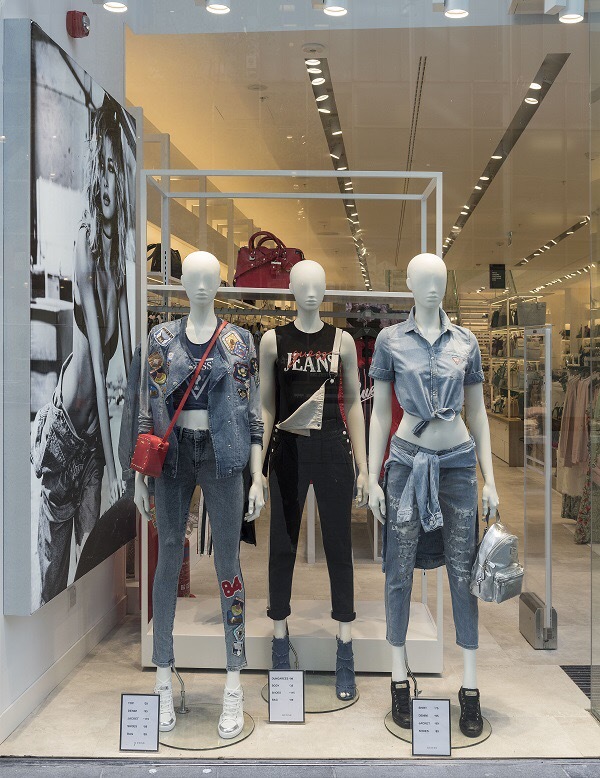 Westfield Stratford gives the brand an exciting opportunity to showcase our entire fashion offering to both new and existing customers,’ says Carlos Duarte, H&M’s country manager UK & IE. 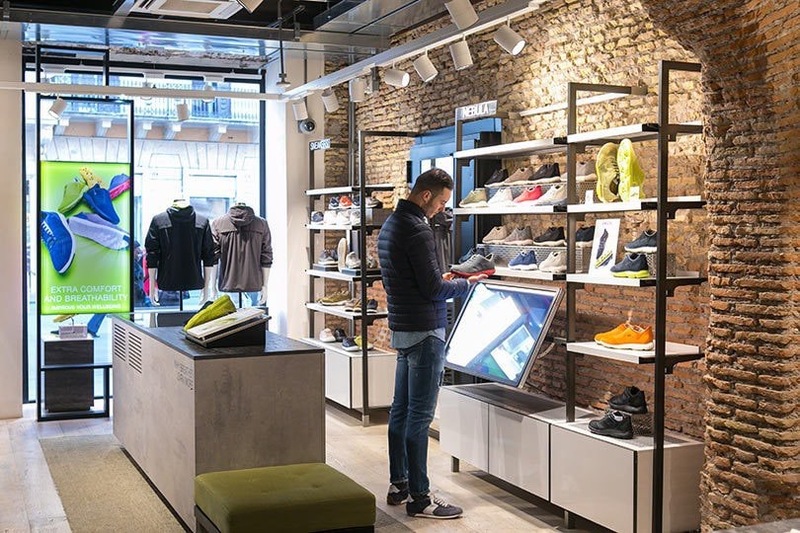 London – Reebok is set to expand its presence in China by opening 500 FitHub stores across the country by 2020, as part of its wider strategy to become the leading sportswear brand in the region. 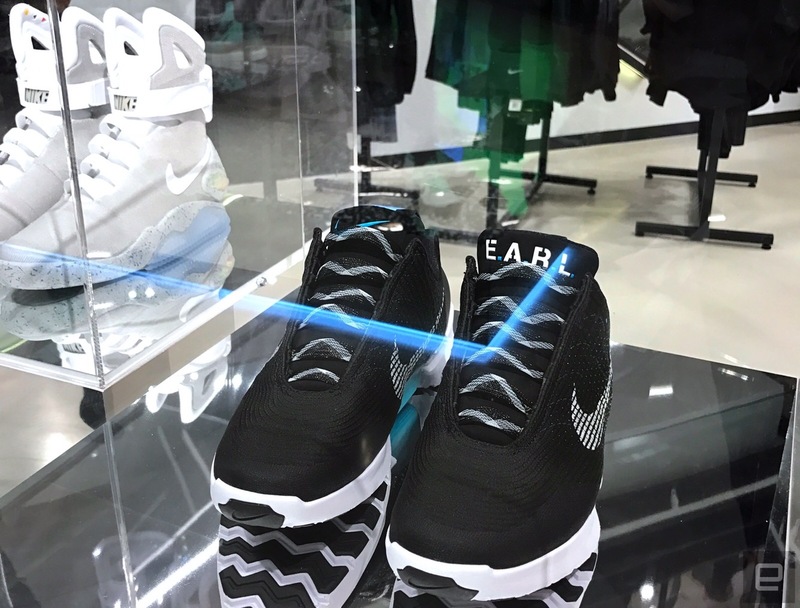 The move sees the footwear and fitness label, held by Adidas Group, go head to head with US rival Nike which is currently viewed as the marker leader in the country. 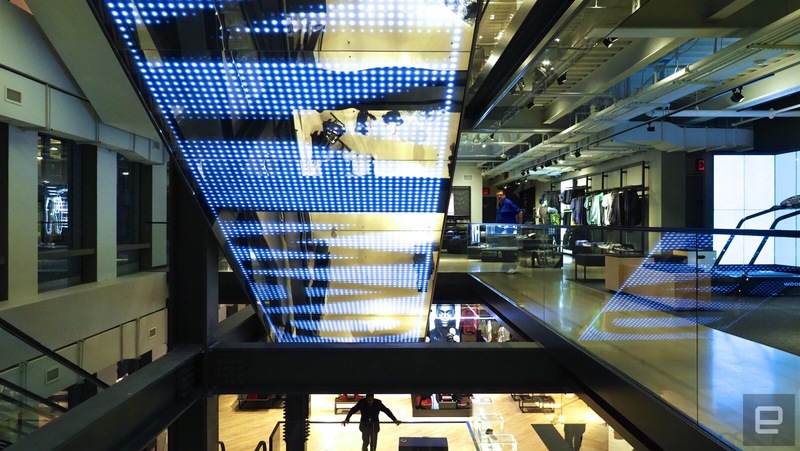 The expansion push sees Reebok team up with Belle International Holdings, one of China’s leading footwear retailers, who will assist the brand in rolling our its FitHub concept stores across the region. 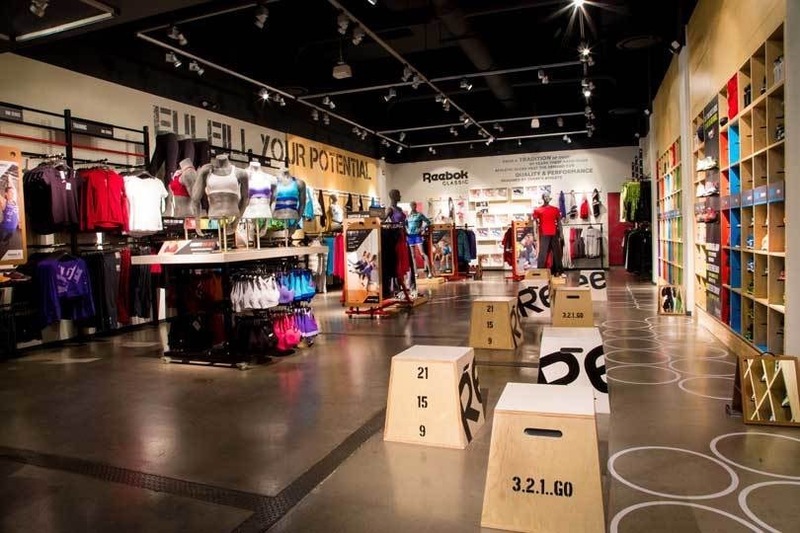 At the moment Reebok counts seven FitHub stores in China, with stores in key cities such as Beijing, Hangzhou and Qingdao as the sportswear label aims to open an additional 50 stores in the region this year. 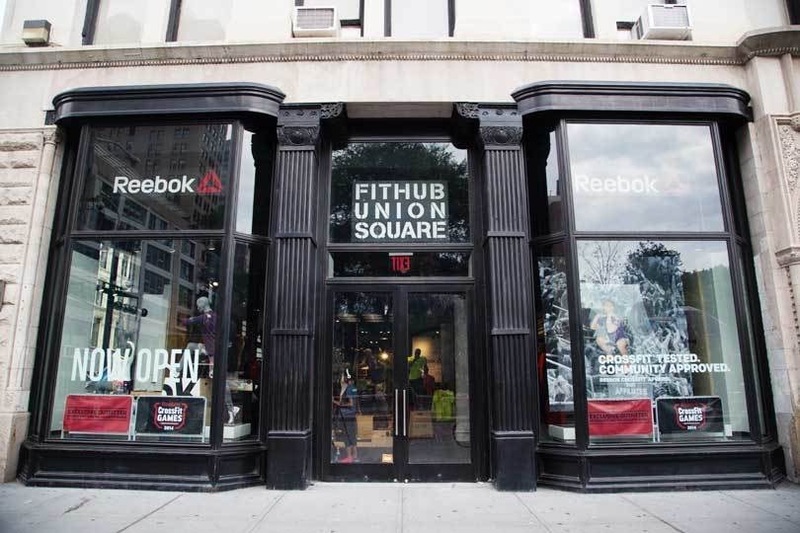 Reebok’s FitHub concept store was designed to compliment the labels new positioning within the sportswear market and features in-store classes, events and fitness experts in store to offer customers tailored advice on products. 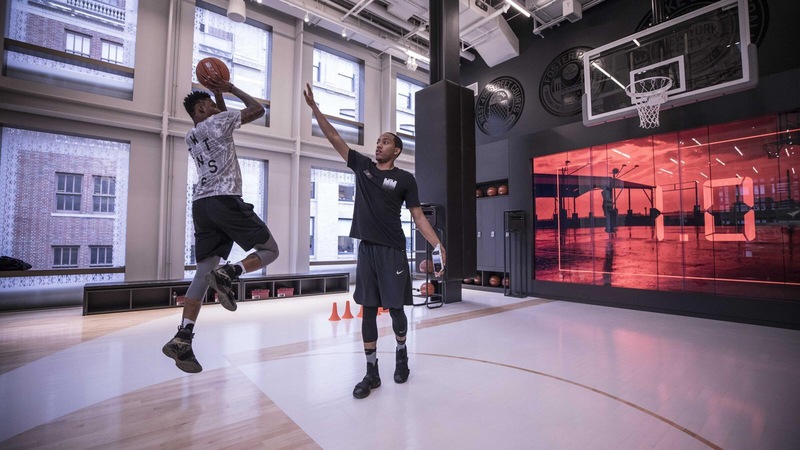 As the sportswear and fitness market continues to rapidly expand in China, the region has become a key sector for international players like Adidas and Nike to expand in. 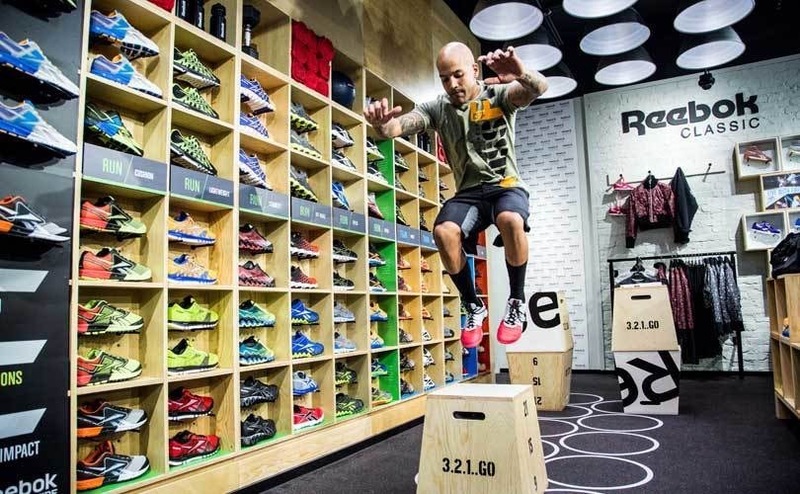 “For a fitness brand, there is no better country to invest in right now than China,” said Chad Wittman, general manager of Reebok Greater China to China Daily. 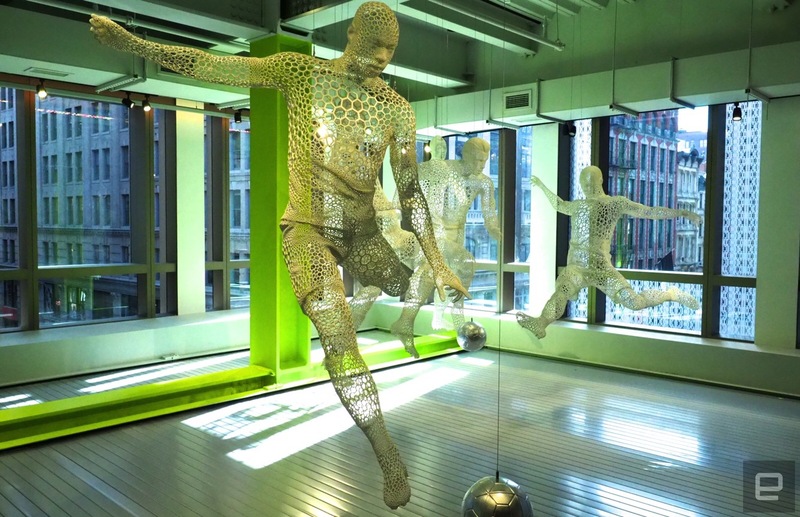 “We’ve spent a lot of time and energy putting together a China strategy that meets the specific needs of Chinese consumers in terms of product, messaging and experiences.” In addition to offering Reebok’s global range of apparel, footwear and fitness equipment, the label is set to offer custom-made products targeted specifically at Chinese consumers. At the moment the brand is focusing on three main categories: running, training and classics. 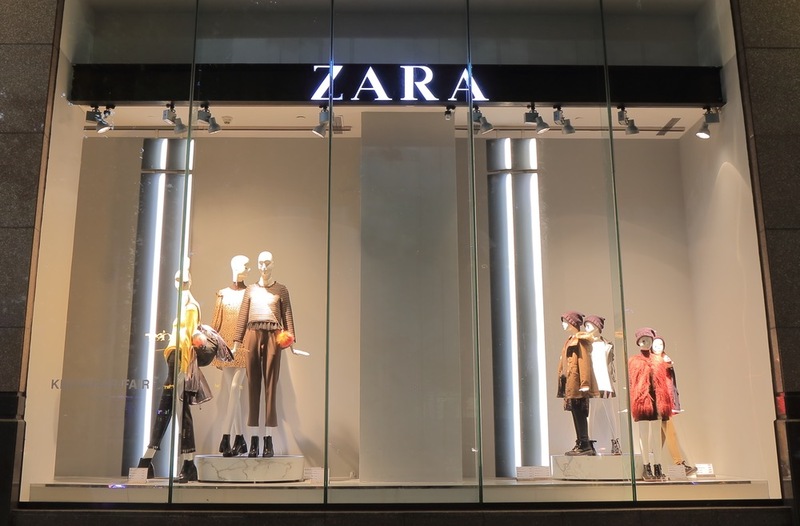 The former is set to become a key focus in China for the brand this year, as running has seen a surge in popularity in China over the past few years. Questions about the future of Agent Provocateur have been raised again after the retailer confirmed it would close down all of its Australian stores and concessions. Three out of the four Agent Provocateur retail locations in Australia have already closed, with the last location in Westfield, Sydney, poised to shutter its doors. According to reports in News Corp Australia media outlets, the last store is selling its remaining stock and would shut once it was sold, or by mid-May, as Agent Provocateur’s new owners aims to focus on the European market. The now-closed locations include a store in Little Collins Street, Melbourne, and two concessions in department store chain David Jones. The store closure affects a total of 20 employees in Australia, with 15 workers holding a full-time contract. However, Agent Provocateur will retain an online presence in Australia through its international website. The news comes less than a month after the British lingerie retailer’s fall into administration and subsequent sale to Four Holdings Ltd – in which Sports Directs holds a 25 percent stake – in a pre-pack administration deal. The deal saw Four Holdings acquire the brand’s UK division and Agent Provocateur global branding rights, but not its international portfolio, leaving 100 retail outlets at risk. Agent Provocateur was offloaded by private equity firm 3i for around £27.5 million. A pre-pack administration is when a business is placed into insolvency proceedings and its assets are immediately acquired by a new owner. 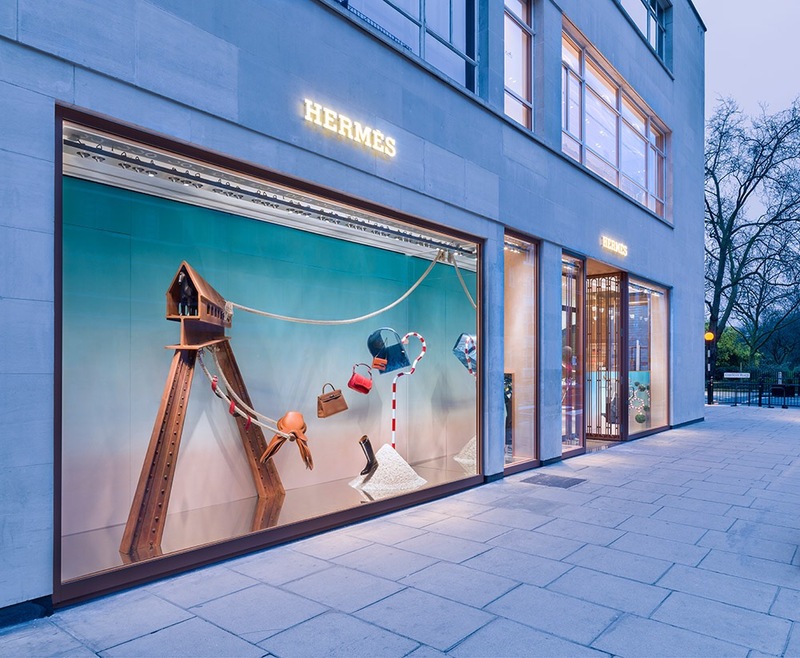 They are often criticised as businesses are able to shed its debts to creditors, and the details of Agent Provocateur’s debts have not been disclosed. The retail chain’s co-founder, Joe Corré said the sale of the lingerie retailer to a firm backed by Ashley was “a disgrace to British business” and a “phenomenal stitch-up”. He also said the “preposterous” transaction between private equity firm 3i and Four Holdings would “face a phenomenal swath of litigation actions”. Since the sale, Sports Direct has clarified in a statement that it was not the new owner of Agent Provocateur, stressing its 25 percent stake in Four Holdings, which is also the parent company of fashion agency Four Marketing. Apple shares latest vision for new Chicago River retail store as roof and curved glass put in placeWe’ve known for a while now that Apple is planning a new flagship waterfront retail store along the Chicago River, and now Apple has shared a new render of what the location will look like after construction wraps up. We also get a look at progress at the site with a new video walkthrough this week. 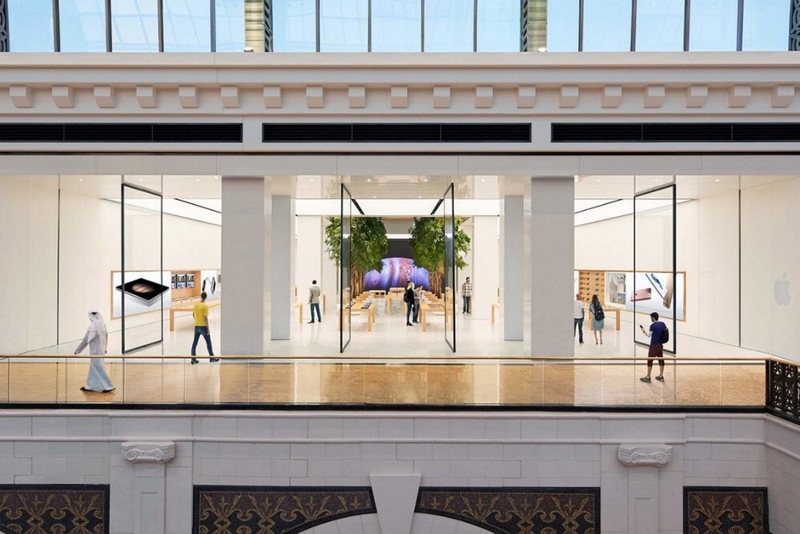 Apple was granted approval for the project back in November 2015, and 9to5Mac reported that demolition of the previous site and new construction for the upcoming flagship Apple Store was underway last December. 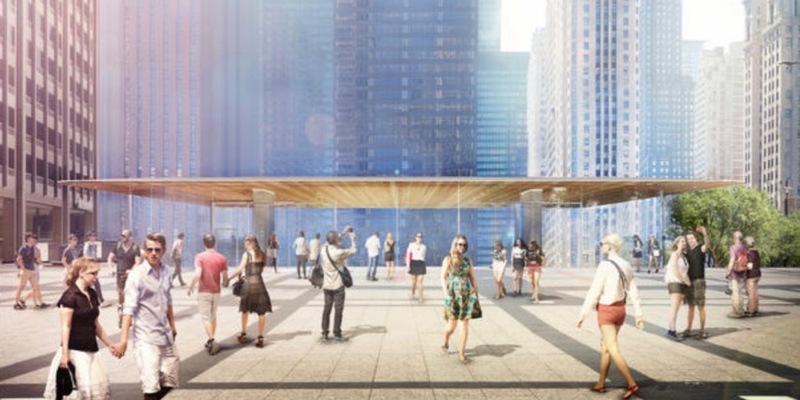 Today the Chicago Tribune has the latest renderings from Apple of what the upcoming retail space is expected to look like when the project is complete. 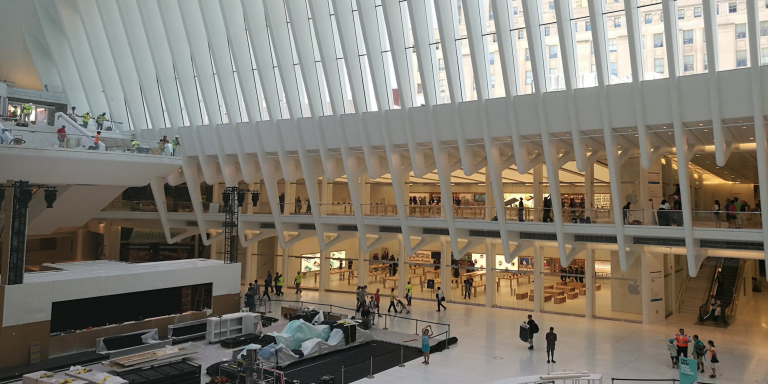 The photo at the top shows the street level view of the glass structure with a massive rooftop centered in an open public space. Foster + Partners, the same firm behind the new Apple Park campus design, is also responsible for what the Tribune says is a $27 million project, although the store still has no target opening date. 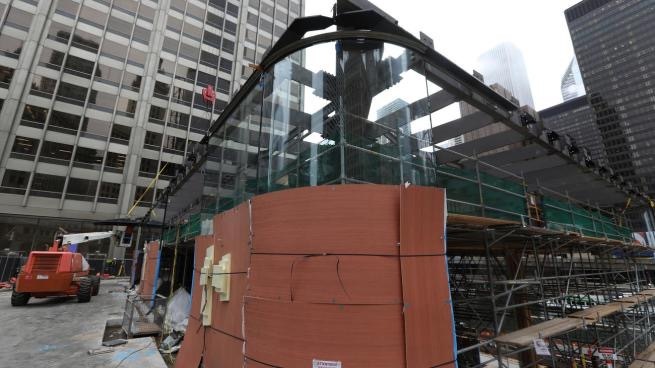 New photos included in the report do show further progress since we last checked in including the curved glass edges in place and the roof being installed this week. The Tribune even says construction workers signed the final support beam used for the new Apple Store. 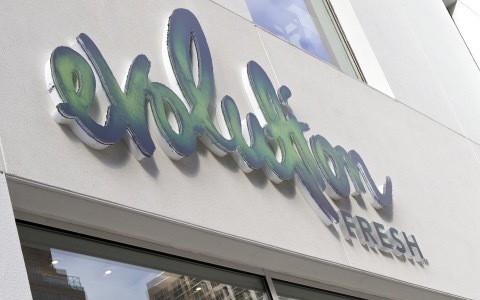 Starbucks is closing its two remaining Evolution Fresh juice stores. Seattle Met first reported that the two Seattle-located stores will close this spring — a move that officially removes the coffee-chain from the fresh juice bar market, notes Consumerist. However, the company is still slated to sell the juices at its coffee storefronts. Starbucks (sbux, -0.28%) bought the Evolution Fresh in 2011 for a reported $30 million. Before, the juice company was a wholesaler, selling its products to high-end grocery stores like Whole Foods (wfm, +1.32%). 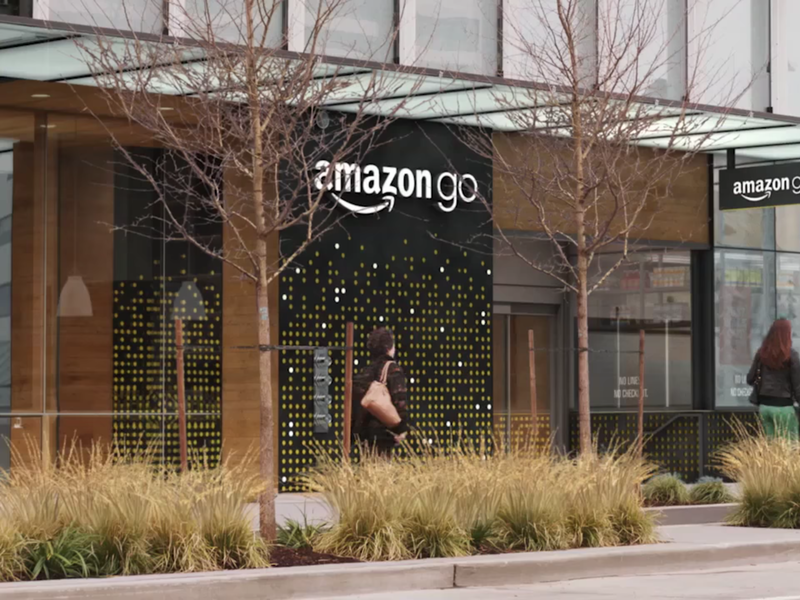 Its first stand-alone stores were opened near Bellevue, Wa., according to Consumerist. The decision to close the final two stores comes after Starbucks debuted four new juice flavors in March of last year, two of which were a part of its “Protein Power” line. AO CEO and founder, John Roberts, will be replaced by COO, Steve Caunce. 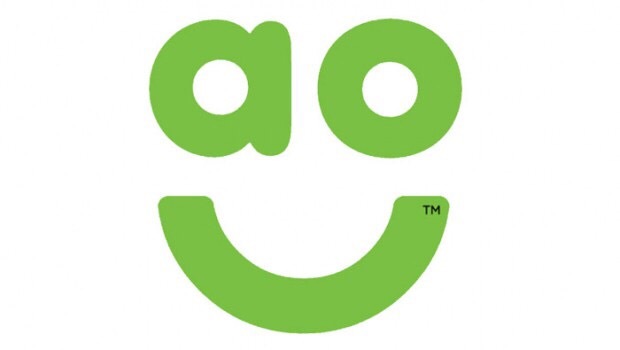 AO World has announced its CEO and founder, John Roberts, is stepping down after nearly 17 years. Roberts created the online electricals retailer in 2000 and will now move to a new executive role. Effective immediately, COO, Steve Caunce, will step up to become CEO. Roberts has always been a big believer of technology innovation, which saw the business quickly launch same- and next-day delivery options as well as develop a significant social media following, thanks to its team of over 100 IT professionals and substantial marketing team. Last year, AO began trading in the Netherlands earlier this month by leveraging its German infrastructure. American clothing brand Guess has decided to venture off into expansion on an international level. Chief executive officer Victor Herrero just confirmed plans to broaden the company’s reach in both Europe and Asia. The company has done well in both North America and South America, expanding in the past couple of years. 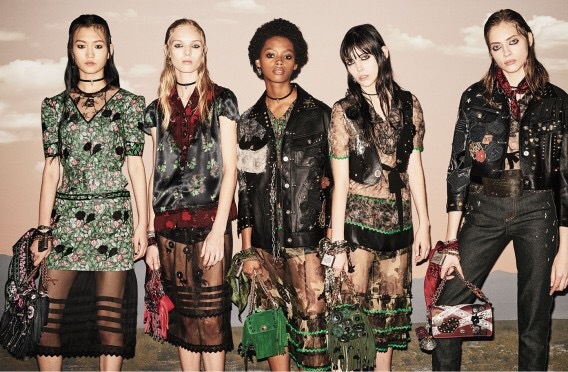 Guess hasn’t done as well in Europe and Asia in terms of performance in its third quarter, as reported by WWD. The quarter, which ended October 29, resulted in a total of 9.1 million dollars in net earnings, which is 3.3 million dollars less than previously. However, the company’s revenue rose three percent, totalling 536.3 million dollars. Due to these results, Herrero has confirmed that Guess is expecting to increase its sales in Europe and Asia in the future. According to the publication, projected sales for Europe and Asia would grow, while its sales in America may decline. Currently, the company has done well in the Americas, as the brand originated in Los Angeles. Known for its iconic, quality jeans, Guess has grown as a staple, iconic brand in America. After recently launching a 35th Anniversary collection, the brand has been able to continue creating unique, high-caliber products. Moving forward,it seems that Guess has plans of increasing sales in all areas on a more global scale, focusing more on international countries. Woolworths says it is beginning to see some “green shoots” in its Australian operations, with significant changes in store for David Jones and Country Road Group. However, the retailer warned that despite this encouraging trend, trading conditions in that market would remain difficult for the rest of the year. CEO Ian Moir said Country Road Group had gone through “a really tough three years”. “We’ve spent a lot of time in the business. It’s really beginning to make a difference. “We are starting to see green shoots and that’s not in just Country Road itself, but also within Witchery. Those two businesses are the biggest and were also the problem children and they are beginning to behave,” said Moir. The Country Road Group houses Country Road, Trenery, Trenery and Mimco. 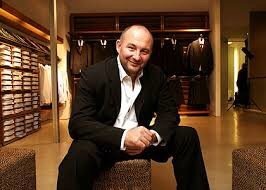 In the 26 weeks ended December 25, David Jones’ sales grew 4% and comparable sales 0.5% in Australian dollars. Country Road Group sales were 0.9% lower than the prior period due to high levels of promotional activity, Woolworths said. Anchor Capital investment analyst Liam Hechter said Country Road’s results were largely expected and were likely to have been more seasonal than structural. “Management made the point that the performance in the second quarter was stronger than the first, so the disappointing operational performance could possibly be short-lived, although we would have to give the numbers and prospects a thorough interrogation over the coming months before forming a strong conviction on that view,” Hechter said. 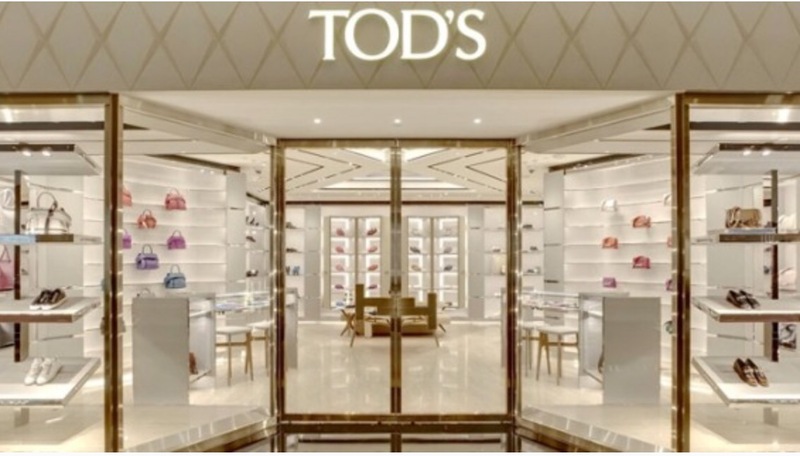 Management had executed well on some of the guided changes at David Jones, while the big source of synergies — the cross-selling of private label products in David Jones stores — seemed to have disappointed. “Not enough has passed to make a definitive call on whether the cross-sell of private label will deliver the expected synergies. When Woolworths bought David Jones, investors expected the guided synergies to be delivered in a linear fashion. While this was always unlikely to be the case, we remain cautiously optimistic that management are on the right track in delivering on the guided synergies although it is likely going to take longer than initially anticipated,” he said. To get bigger, The Wendy’s Co. is getting smaller. The Dublin, Ohio-based burger chain wants to add another 1,000 locations by 2020, executives told investors on Thursday. One strategy the company plans to use to encourage that growth is a new, more flexible design that will enable Wendy’s to go into smaller spaces. Wendy’s currently has just more than 6,500 locations worldwide. It wants to grow to 7,500 units by 2020. 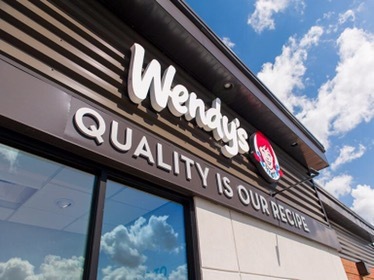 The locations would be both in North America, where the brand has commitments from operators to build at least 500 locations, and internationally — where Wendy’s wants to grow from 439 locations now to 850 units. Traditional sites are more difficult to open because real estate is more challenged today than it was a decade ago. One-acre sites in high-traffic areas don’t exactly grow on trees. And when they come along, they can be expensive. 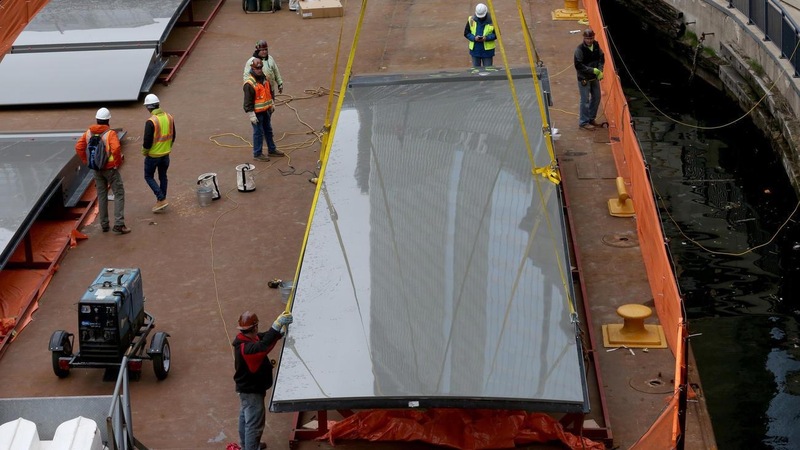 The new design, executives said, is $300,000 cheaper than a traditional site. One conversion opportunity, Pringle said, is banks. Wendy’s discussed its long-term strategy with investors on the same day it preannounced earnings for the fourth quarter ended Jan. 1. 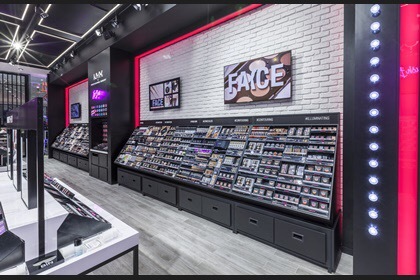 The company said same-store sales increased 0.8 percent in the quarter and 1.6 percent for the full year in North America. Revenue in the quarter fell 33 percent, to $309.9 million, in the quarter, from $464.4 million, due to lost sales from the sale of restaurants to franchisees. Net income also fell, to $28.9 million, or 11 cents per share, from $85.9 million, or 31 cents per share. Executives at the presentation said they want to increase profitability in addition to adding new locations. Some profitability will come from reductions in general and administrative spending. Wendy’s said it wants to cut another $35 million from G&A spending by 2020. “We’re committed to accelerating savings,” Penegor said, although he noted that the company is currently developing plans to cut those costs. Wendy’s said Thursday that it added 58 new restaurants worldwide in 2016. “That was the highest global total since 2005,” Penegor said. To get operators to build new locations, Wendy’s isn’t just using a smaller design. It’s also offering incentives. The abatement is reduced to 4 percent in the second year, including 1 percent on royalty payments and 3 percent on ad fund payments. Wendy’s has also used its refranchising deals, and even franchisee-to-franchisee sales, to convince operators to add locations. The chain has sold more than 1,000 locations to franchisees since 2013, following the sale of 537 locations in the third phase of that effort. Wendy’s has reduced its company-owned unit count from 1,427 locations in 2012, or 22 percent of the system, to 330 units now, or 5 percent. The company has sold many of these locations to operators willing to build new locations. Wendy’s also has a “buy-and-flip” strategy, in which it directs the transfer of franchisee-owned locations to preapproved operators willing to remodel locations and build new units. As part of these strategies, Wendy’s now has fewer, larger franchisees. In 2012, the company had 440 franchise companies. Today it has 375. The average size of a franchisee has increased from 11 locations to 15 units. H&M stores have been spreading across the world like a fast-growing mold. For at least a decade, the fast-fashion retailer has increased stores by 10% to 15% annually, sometimes squeezing them in at a preposterous density: In New York in 2015, the chain opened a 63,000-square-foot behemoth that was literally across the street from another H&M (and just down the street from still another). But the company says it’s finally time to ease off. Sales are slowing, and those physical stores no longer serve as the profit machines that turned the chain’s chairman into Sweden’s richest person. 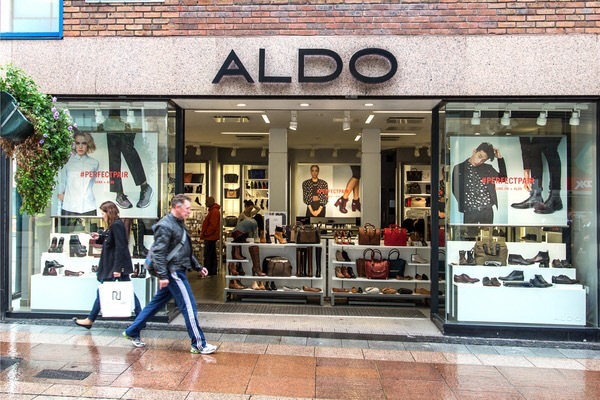 In reporting its 2016 earnings, which saw sales rise 6% for the year, the company yesterday said it is replacing its brick-and-mortar expansion target with a new sales target of 10% to 15% annual growth. 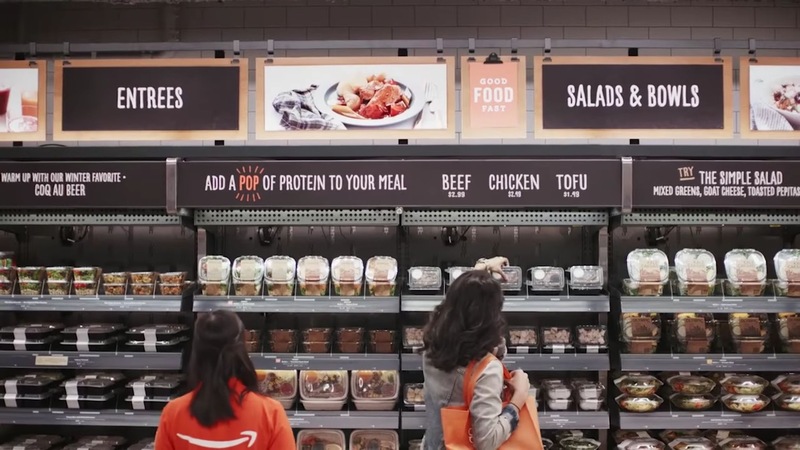 This new bullseye includes in-store and—importantly—online sales. Like pretty much every other retailer, H&M acknowledges that more dollars are moving to e-commerce, and that it already has plenty of stores selling its ultra-cheap clothes. 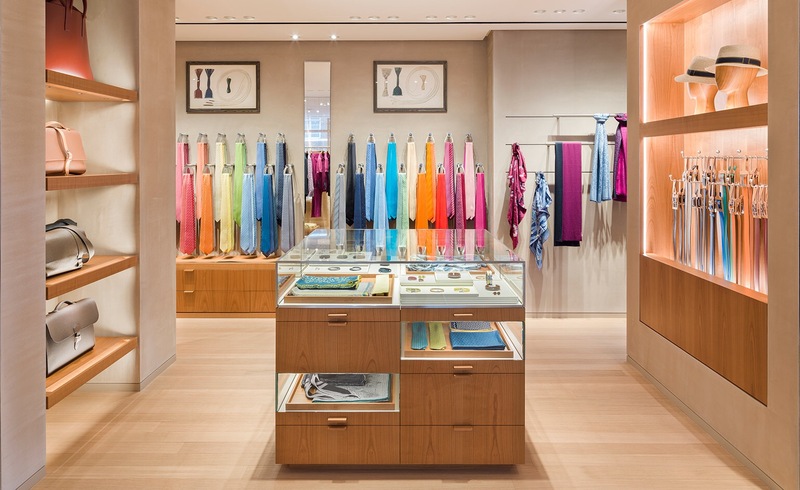 While physical stores are far from dead, their value is changing as the retail landscape shifts. 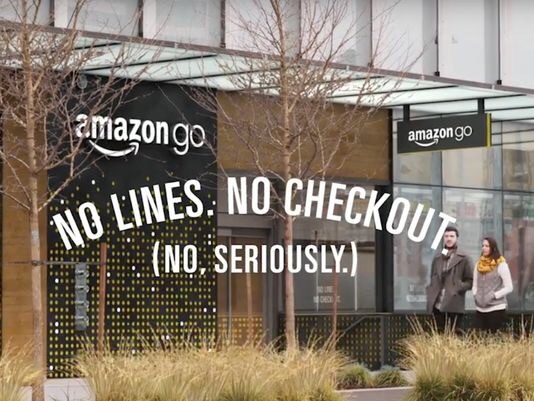 Increasingly they have to offer customers experiences to be worthwhile, because if all shoppers want is a place to buy things, they can do that on the internet. 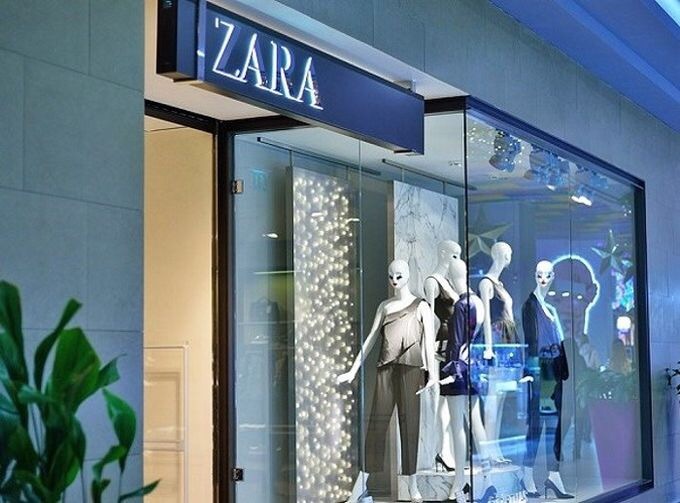 Zara, which is H&M’s big fast-fashion rival, said last year that it would pull back on store expansion to focus more on its online sales. And H&M’s physical stores aren’t bringing in the profits they used to. 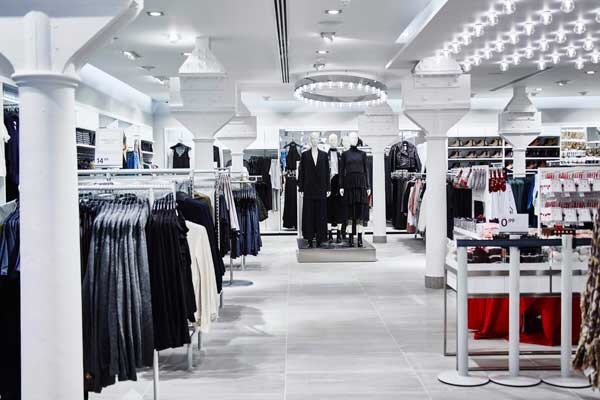 A report by analysts at Morgan Stanley last year pointed out that the profit H&M stores bring in isn’t keeping pace with their rapid proliferation. The analysts worried H&M was reaching a “mathematical tipping point,” which could cause profits to fall sharply by 2020. Clothing retailers with less healthy businesses have been shuttering their physical stores like crazy: See Macy’s and other department stores that analysts think need to shut hundreds of locations to restore their sales-per-square-foot productivity. 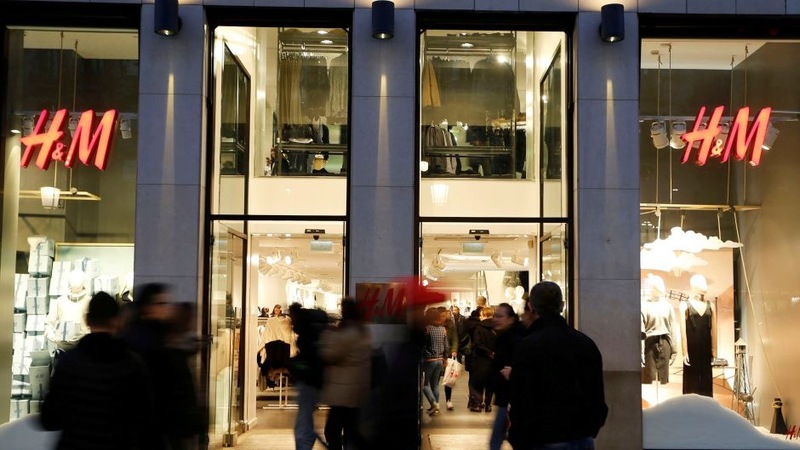 H&M, which operates more than 4,300 stores worldwide, has evidently gotten the message that populating the earth with more stores isn’t going to keep adding more profit. Still, it’s not slamming the brakes on entirely: In the year ahead, the company plans to open around 430 new stores, entering new markets in Kazakhstan, Colombia, Iceland, Vietnam, and Georgia, among others. 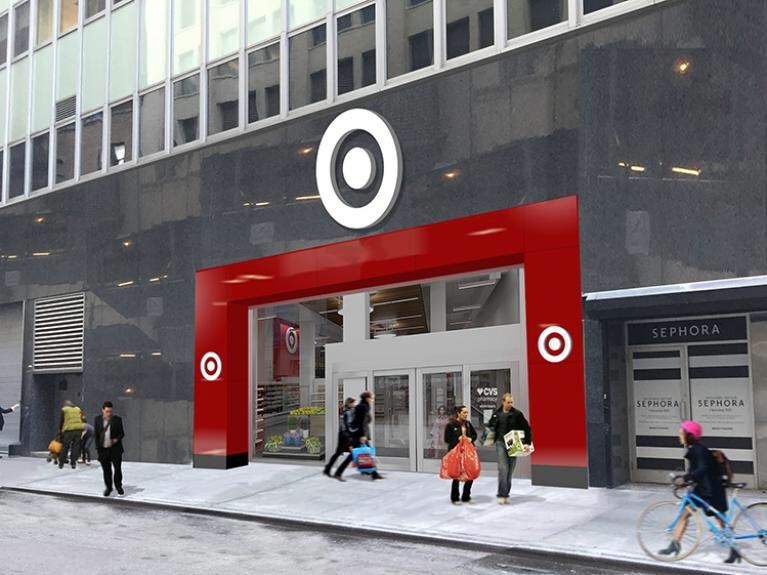 That’s about the same number of stores it opened in 2016, and represents roughly 10% growth of its current portfolio—in line with its former target. But the indication is that sort of brick-and-mortar expansion won’t continue for much longer. H&M also plans to enter six new markets online in 2017, focusing on Asia. Shoppers in 35 of the 64 markets H&M serves could already browse and purchase clothes online by the end of 2016. H&M is fighting many of the same challenges as other fashion retailers, including a shift in consumer spending to experiences and away from stuff. More stores, it has finally acknowledged, aren’t the solution. For the full-year as well as fourth quarter ending November 30, 2016 H&M group’s sales including VAT increased by 7 percent in local currencies. 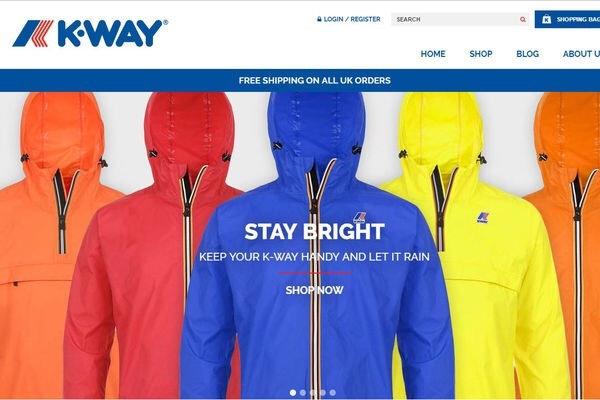 The company has said in a statement that it aims to achieve a sales growth target of 10-15 percent per year and will continue its offline and online expansion in the existing and new markets. Converted into SEK, sales for the year, including VAT increased by 6 percent to 222,865 million Swedish krona (25,229 million dollars), while sales excluding VAT amounted to 192,267 million Swedish krona (21,765 million dollars). Gross profit increased to 106,177 million Swedish krona (12,018 million dollars) against 103,167 million Swedish krona (11,678 million dollars), corresponding to a gross margin of 55.2 percent. Profit after financial items amounted to 24,039 million Swedish krona (2,721 million dollars) compared to 27,242 million Swedish krona (3,083 million dollars) last year. The group’s profit after tax amounted to 18,636 million Swedish krona (2,109 million dollars) against 20,898 million Swedish krona (2,365 million dollars), corresponding to11.26 Swedish krona (1.27 dollars) per share. 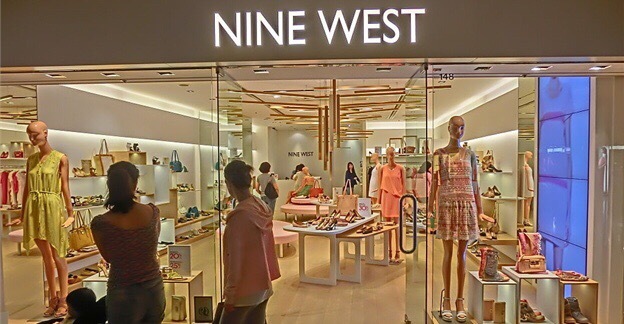 The company said, profits during the year were negatively affected by increased mark-downs but also by higher purchasing costs from the strengthened US dollar. 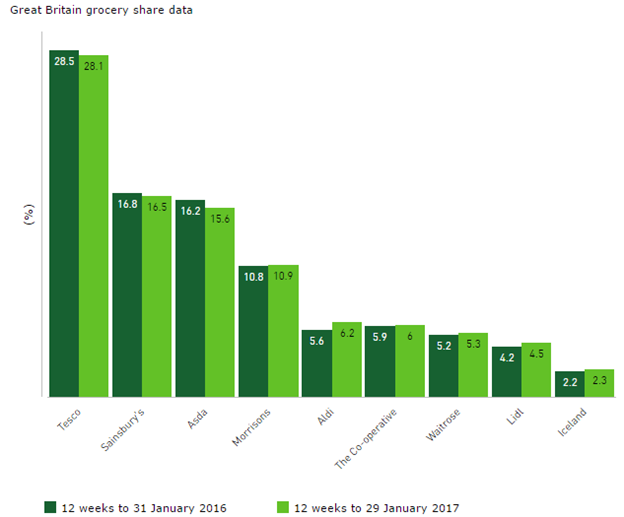 The company reported continued strong online development for all brands both as regards sales and profitability and witnessed strong sales growth for COS, & Other Stories, Monki, Weekday and H&M Home during the year. 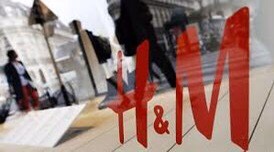 For the fourth quarter, H&M group’s sales including VAT increased by 7 percent in local currencies. Converted into SEK, sales including VAT increased by 8 percent to 61,098 million Swedish krona (6,922 million dollars). Gross profit increased to 30,027 million Swedish krona (3,398 million dollars), corresponding to a gross margin of 57 percent. Profit after financial items increased to 7,409 million Swedish krona (838 million dollars). The group’s profit after tax increased to 5,914 million Swedish krona (669 million dollars), corresponding to 3.57 Swedish krona (0.40 dollar) per share. H&M carried out a strong expansion during the year with a total net addition of 427 new stores and 11 new H&M online markets. 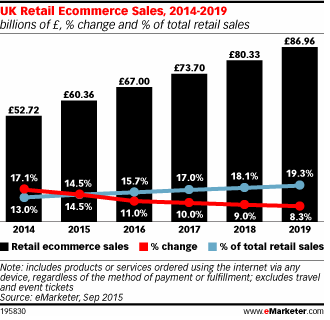 At the end of the financial year H&M had 35 online markets and the number of stores amounted to 4,351 in 64 markets. 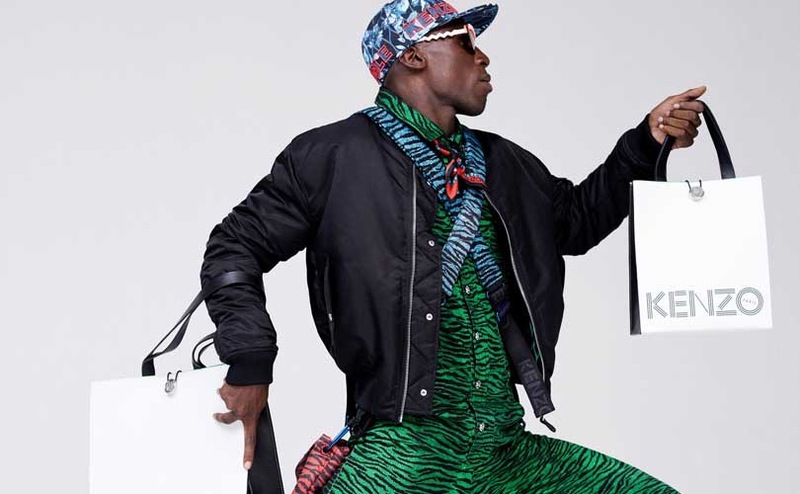 During the fourth quarter, the company ventured into new markets – Cyprus and New Zealand, as well as rolled out H&M online platforms in Canada and South Korea. The Board of Directors proposes a dividend of 9.75 Swedish krona (1.10 dollars) per share for the 2015/2016 financial year. The group has announced a new growth target and aims to increase the sales by 10 – 15 percent in local currencies per year with continued high profitability. The H&M group’s sales including VAT in December 2016 increased by 6 percent in local currencies compared to the same month the previous year. Converted into SEK the increase was 10 percent. The H&M group’s sales including VAT in the period January 1 to January 29, 2017 increased by 11 percent in local currencies compared to the same period the previous year. The H&M group plans to open approximately 430 new stores net in the 2016/2017 financial year. Kazakhstan, Colombia, Iceland, Vietnam and Georgia are planned to become new H&M markets. In addition, H&M plans to continue its online roll-out into six new markets: Turkey, Taiwan, Hong Kong, Macau, Singapore and Malaysia. The company also plans to launch one or two new brands in 2017. Struggling teen retailer Wet Seal is closing all 171 of its stores. In a letter dated January 20 that was obtained by The Wall Street Journal, the apparel retailer notified employees working in the company’s Irvine, California headquarters that the office was permanently shutting down and laying off all of its workers. According to the Journal, Versa Capital, which acquired the brand for $7.5 million in cash in April 2015, couldn’t raise the necessary funding or find a buyer to keep the brand alive. 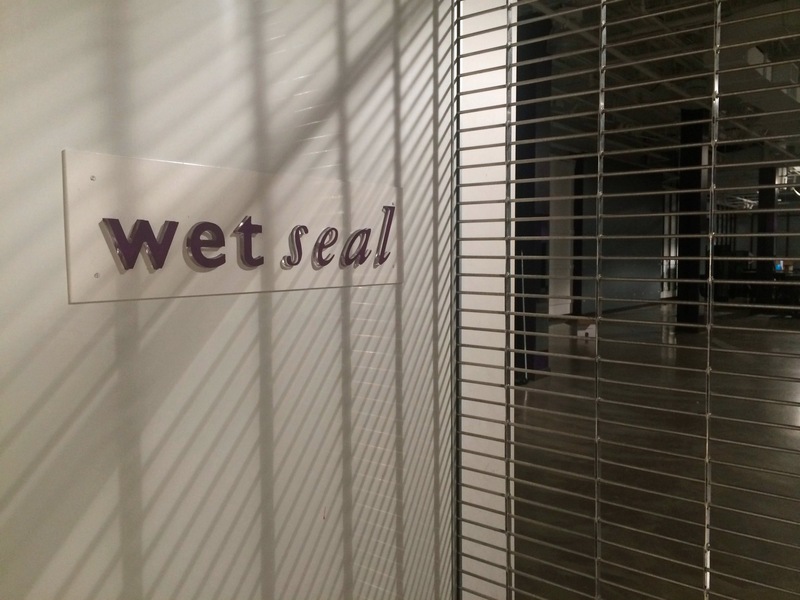 Wet Seal closed 338 of its then-511 stores in January 2015, shortly before the company filed for bankruptcy protection. Then, Wall Street analysts said that falling foot traffic at shopping malls played a major role in Wet Seal’s death spiral. 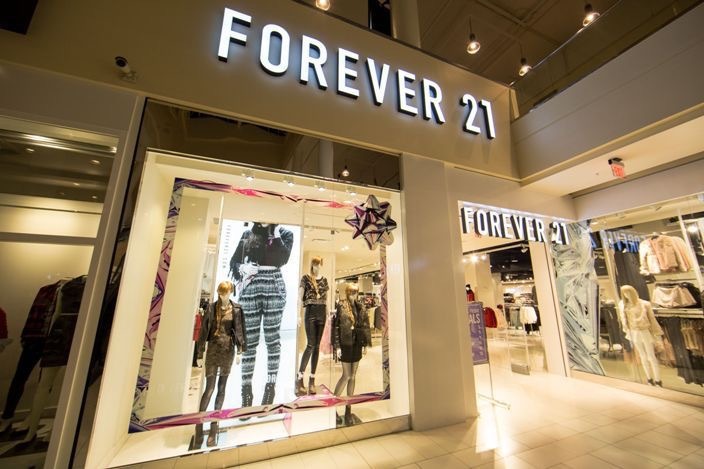 The teen retailer isn’t the only brand facing store closures as shoppers ditch malls. Earlier in January, The Limited, another apparel brand primarily based in malls, shut down all 250 of its stores and laid off 4,000 workers. Mall staples Sears and Macy’s have also announced mass closures this year, with Sears planning to close 150 namesake stores and Kmart stores in 2017 and Macy’s planning to shutter another 100 stores. Struggling specialty apparel retailer Limited Stores is preparing to file for bankruptcy in the coming weeks and will most likely liquidate its business, Bloomberg reports. 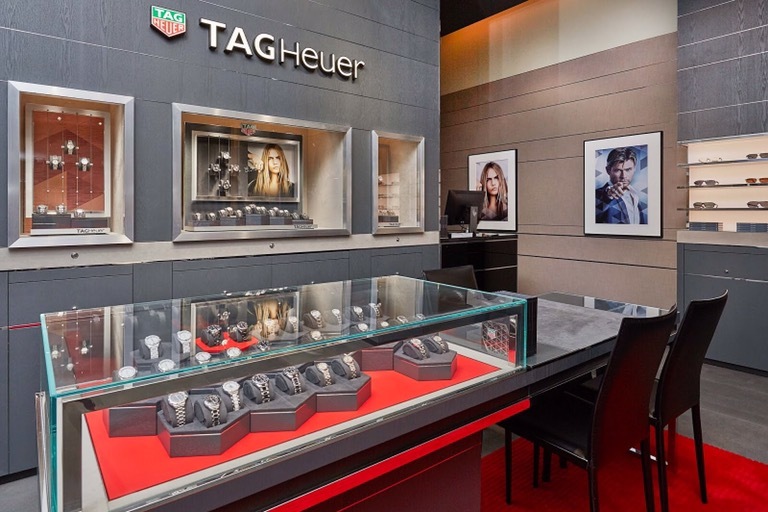 Last month, the retailer hired Guggenheim Partners to explore a sale and said it was entertaining bids, according to The Wall Street Journal. The company has some $100 million in debt, sources told Debtwire. Private equity firm Sun Capital owns the struggling chain, but private equity firm Cerberus Capital Management is its largest lender, sources told the New York Post last month; that sets up a potential clash of interests as the retailer’s fate unfolds. The company also recently notified the Ohio Department of Job and Family Services that it may lay off as many as all 248 employees, including its entire headquarters staff, and close down that Columbus, OH-area office as it struggles with plummeting sales. The retailer is a shadow of its heyday as a successful speciality mall retailer. Former parent L Brands (owner of Victoria’s Secret and Bath & Body Works) sold a 75% stake in The Limited to private equity firm Sun Capital in 2007; three years later, Sun acquired the remaining 25% stake. But some malls, themselves suffering from falling foot traffic as e-commerce sales rise, aren’t always especially helpful to stores like The Limited, which has 243 stores across the country. 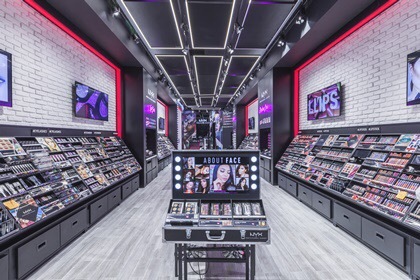 Limited Stores has hired RAS Management Advisors to advise on strategic and financial alternatives, including a potential restructuring, sources familiar with the matter told Debtwire, and the company has also hired Kirkland & Ellis as its legal adviser, according to Bloomberg. The Limited, Guggenheim Partners and RAS Management didn’t respond to requests for comment. John Buell, named interim CEO of struggling women’s apparel retailer The Limited in October, has left the company to become the senior vice president and CFO of fashion and home decor brand Altar’d State, the Columbus Dispatch reports. Earlier this month The Limited said it might shutter its headquarters and close all stores permanently amid plummeting sales and crushing debt. 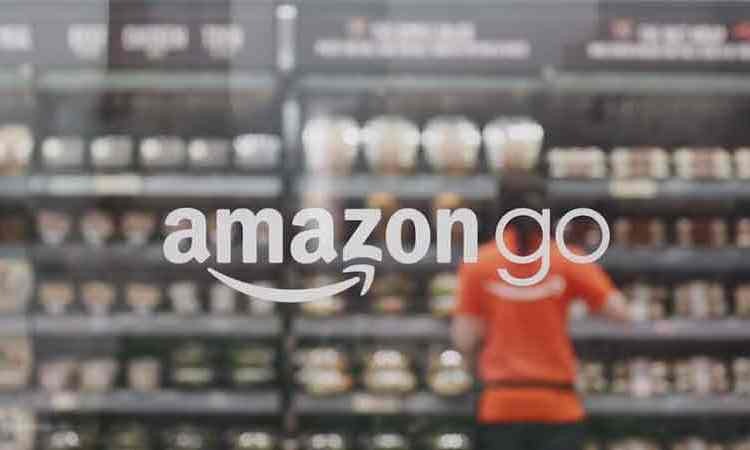 The company had previously hired Guggenheim Partners as financial adviser to explore a possible sale or restructuring, with rival retailers or private equity firms as potential suitors. 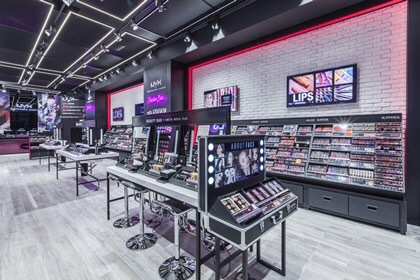 The New Albany-based retailer, which has 243 stores across the country, was formerly owned by L Brands (owner of Victoria’s Secret and Bath & Body Works), which sold a 75% stake in The Limited to private equity firm Sun Capital in 2007. Sun acquired the remaining stake three years later. While Sun Capital touts The Limited as a place to buy “upscale” women’s clothing, the retailer is operating as a shadow of its former self, beset by falling mall traffic and styles that can also be found at rivals like Loft and at department stores. The Limited’s appeal may be further muddled​ by its recent “Backroom” off-price effort. As online sales of apparel continue to rise, pressure on malls to revive or shutter is increasing, vexing specialty retailers like The Limited that are so dependent on their customer appeal. The U.S. currently has about 1,100 enclosed malls, but Jan Rogers Kniffen, CEO of J. Rogers Kniffen Worldwide Enterprises, said earlier this year that number should be closer to 700. 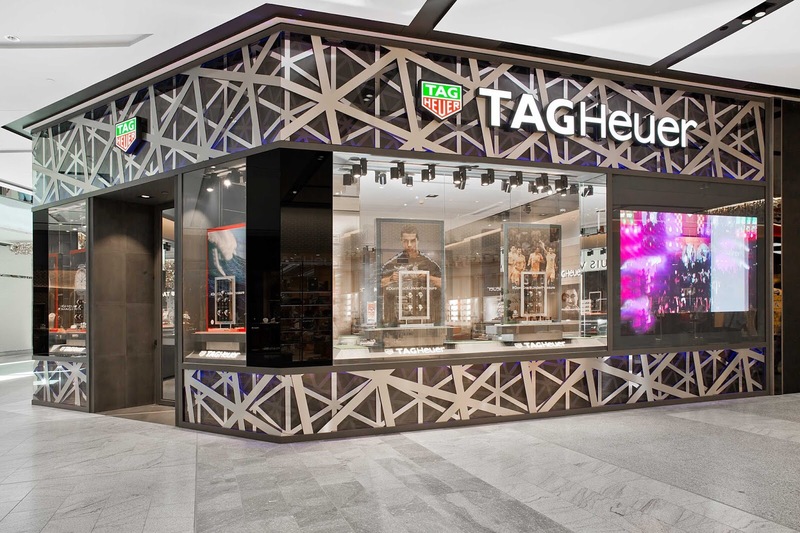 TAG Heuer has opened a new boutique on Australia’s iconic Gold Coast at the newly transformed Pacific Fair Mall. 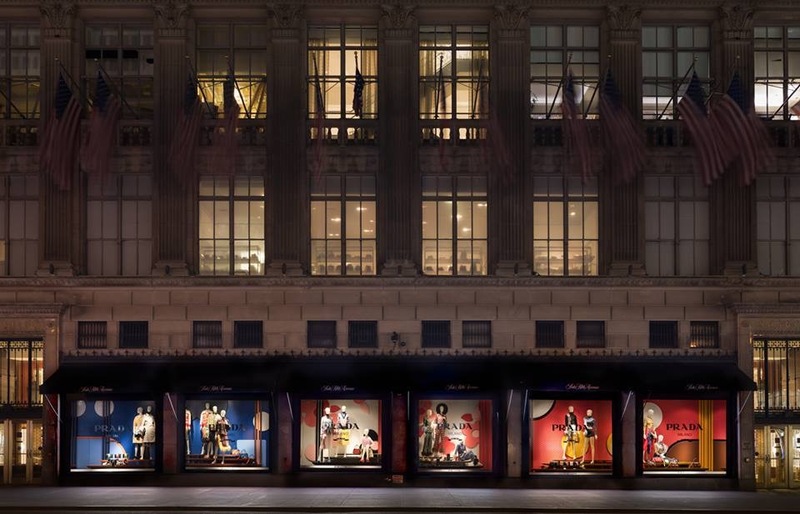 The new store which covers 153 sqm and showcases new retail design concept of the brand – a new look and feel for the iconic luxury brand that was first unveiled in Sydney with the relaunch of the iconic Sydney Flagship boutique on the corner of Pitt & Market St.